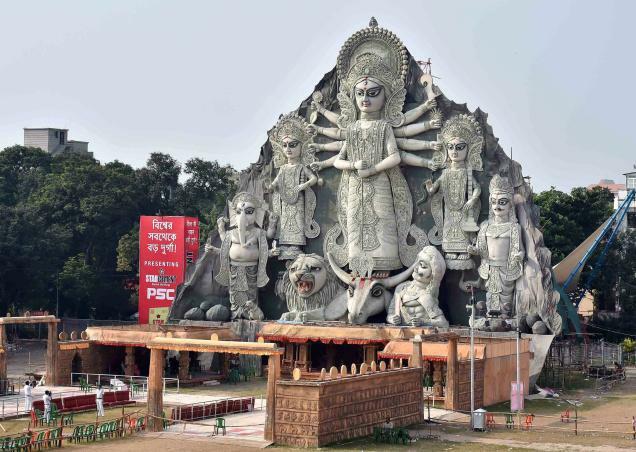 There was a huge jam because of Durga Puja , more so, because of Deshapriya park puja and its famous 88 ft Durga puja (The tallest ever Durga idol.The tallest ever Durga idol in the world has now found a place in the Limca Book of Records, Asian Book of Records and Indian Book of Records. It may also lead its way to the Guinness World Records ). Today is Chaturthi , but Saturday ! Somehow we got down from the bus near Ujjala cinema and took a Taxi - which took us to Babu Ghat. From Babu Ghat, I took the ferry to reach Howrah station just 5 minutes before time ! We left for Turkey on October 17 by Yuva express at 6.40 pm. The worst train I have ever travelled. Yuva express is a 17 hr sitting car train - 3+3 !! The chairs are not reclining ! In one word it is hell ! We reached Delhi before lunch and reached Gita Jethima's house at Pocket 40, CR Park. After chatting some time we had our lunch at her place and took some rest. While Mohua was sleeping I went to see Pujo in Delhi , CR Park after a long time. The Puja in Delhi is still what used to be in Kolkata in 1990s. I went to see the puja at Pocket 40, B Block, Co-operative Ground, Mela Ground. At Mela ground I met Joyda after a long time. He used to play football here.He was a good footballer.Today is Panchami ie 5th day. In Pocket 40 , B Block and Co-operative ground they have organized Anandamela i.e. all the housewives will bring their home cooked dish and will sell from the table allocated to them and judges will select a winner for being the best cook. We ,met Sanchita and Joydeep there. Sanchita had a table where she is selling some prawn items. I helped them to write the poster in Bengali . In the evening Mohua joined them and we chatted for quite some time. We had our dinner at home with Jethima (aunty). Our plane is at 11 am. So we took an auto from CR Park to go to Nehru Place metro station. 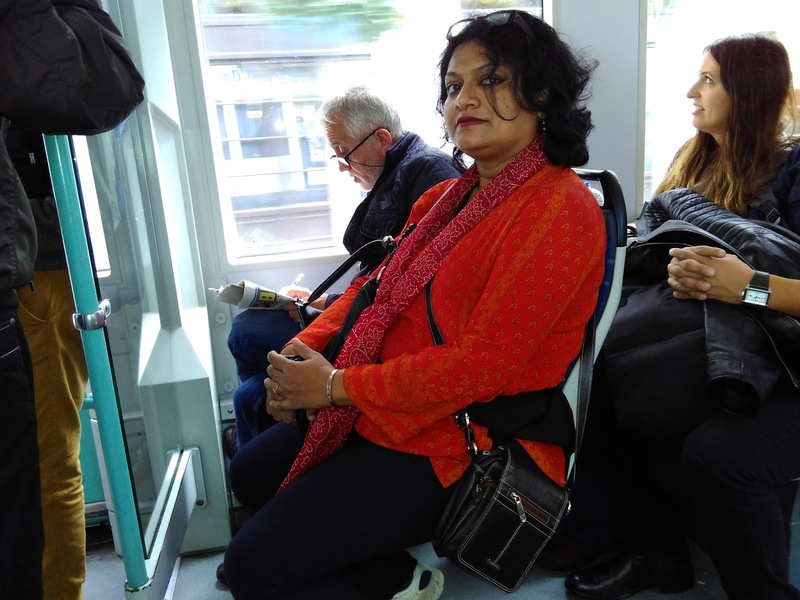 From there we changed the metro at Central Secretariat to go to New Delhi (station) for Rs 18 and from New Delhi (station) we took airport express (Rs 60) to reach the airport comfortably. 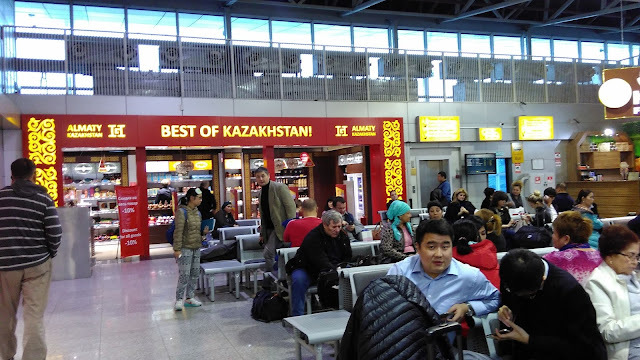 In 5 hours time we reached Almaty (by Air Astana - one of the best and cheapest @ Rs 37,500 to and fro) at Kazaktastan at around 3.30 pm and around 5 pm took the next flight to go to Istanbul. Almaty, was the former capital of Kazakhstan. That’s a question I always got from people, the answer is Turkey has the most varied and diverse sights you could see in a single country(except maybe India). You have the Byzantine monuments of Istanbul like Ayasofya, the Ottoman mosques and palaces, in Western Turkey at Izmir you get to see Greek and Roman cities all intact, then you have Cappadocia, which has amazing rock formations on limestone and some really awe-inspiring cave towns and castle,straight out of Flintstones. ... And the landscape? It’s always spectacular, huge grasslands, snowy peaks, meadows..and the food? 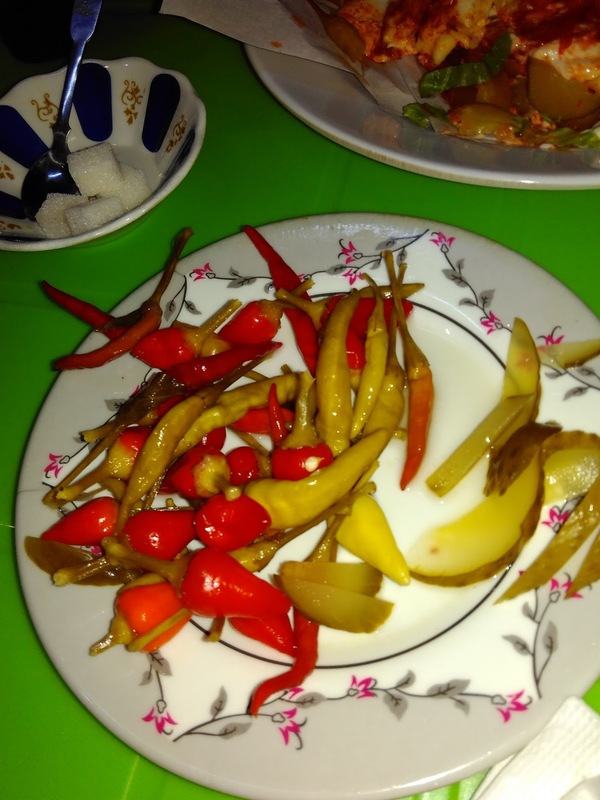 Nothing short of fabulous, even to my taste buds which are used to spicy and heavy food. And I haven’t even covered the Mediterranean coastline of Turkey, 13 civilizations have existed in Turkey, and all of them have a significant impact on the culture, and you can see it all!! So that’s why Turkey. Just before our tour, there was bombing in Ankara , Turkey - resulting some of my friends telling me, to cancel the tour ! It is important to understand the history of Turkey also. The first phase of human Civilization, that is the ancient period came to an end in 476 AD with the fall of Western Roman Empire and with that started medieval period or middle ages .With the fall of Constantinople in 1453 came the end of medieval period or middle ages. In fact With the fall of the Western Roman Empire in 476 AD, the Colosseum was abandoned and plundered. In a similar way, the fall of Gupta Empire, brought into the middle ages or medieval period in India. After the fall of Gupta Empire , there was no existence of United India till 1750. Octavian or Augustus was the first Roman Empire after whom many others ruled Rome – but not all of them are alike, some are week some are strong.Constantine was the last powerful emperor of Rome (ancient period) whose reign is memorable for various events.Constantine had divided is Empire into two parts Eastern Roman empire (today's Turkey etc) and western Roman empire from Rome in the early 4th century and laid foundation to second capital of the Empire at Byzantium (today's Turkey) on the Black Sea. The Byzantium situated on the strait of Bosphorus was a Greek Colony which was later renamed Constantinople after him. There are some strategic reasons why Constantine found the second capital at Constantinople. At that time western part or Roman Empire was in danger by Barbarian invasion. The Barbarian Invaders even threatened the city of Rome. The situation of Constantinople was very favourable both for defence and also for ruling over European and Asian parts of Roman Empire. Moreover Eastern part of the Empire was much prosperous economically and culturally than the Western part. Another important event of the reign of Constantine was the recognition of Christianity as state religion. Christianity had an enormous influence on the slaves and poor. Most of the Roman Empires before Constantinople prosecuted the Christians as they refused to bow before the Emperor. Constantine was the first ruler who understood without the help and support of thousands of Christian he would not be able to resist the Barbarian attacks and maintain in the Roman Empire. It was not known when he was baptized to Christianity. Constantine died in 337 AD. Theodosius one was the last Roman Empire who could maintain the solidarity of the Roman Empire for the last time. After his death in 395 AD his sons got the Roman Empire divided between themselves .Honorius controlled the west from Rome and Arcadius controlled the East from Constantinople. The Eastern Roman empire was known as the Byzantine Empire. Thus the once glorious Roman Empire virtually got divided into two parts. Emperor Justinian of Byzantine tried to unify the Western Roman Empire. The Western Roman Empire decayed due to Barbarian invasion in 476 AD. The Byzantine emperor consisting of the prosperous region of Egypt Syria, Balkan and Asia Minor could last for another 1000 years. Justinian was the most outstanding ruler of the Byzantine Empire. He ascended the throne in 527 AD. In spite of his effort Justinian could not be established the old empire of Rome. Justinian was a versatile genius and was a great patron of art and architecture. Under his patronage numerous building and structures were built all over Byzantine Empire. 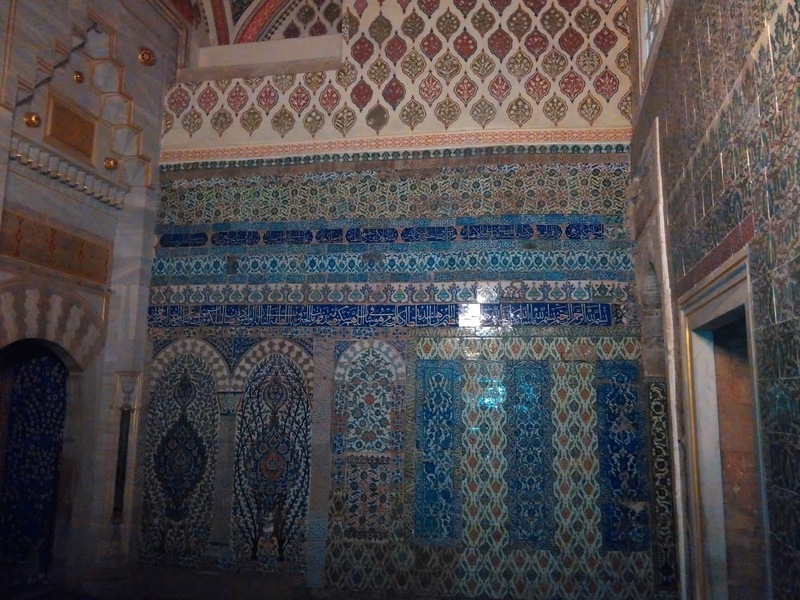 The Splendor and decoration of the palaces of Constantinople are the topic of discussion of contemporary people. The most magnificent of all was unique Saint Sophia church in Constantinople. He hardly slept because of his terrible passion for work and reading and writing. Today the population of Turkey is 78 million or 7.8 crore and per capita income is around 10,000 USD ie almost 5.5 times that of India. 1 TL = Rs 22 approx at the time of our travel. 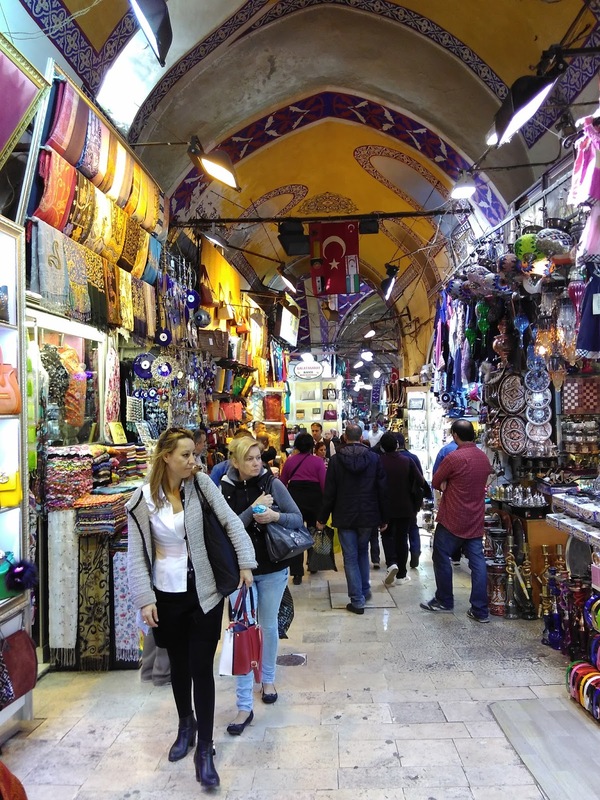 Getting a visa: Turkey provides an easy eVisa application for 98 countries. The Turkish Government has made an excellent website. However, if you want the help of a visa specialist - my recommendation is to get your Turkish Visa Online with iVisa. They provide helpful advice and the staff is knowledgeable. 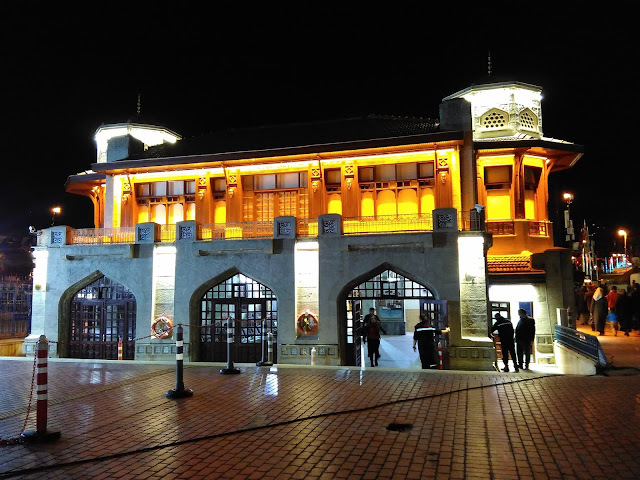 If you have travelled to US or have Shenzhen visa, then it is super easy and cheap and can do it online - for that visit the website of Turkish embassy. · Valid passport with at least 6 month validity from the date of travel. · 2 Fresh Photos of 50 x 50 mm size, WHITE background and with matt finish (2 photos mandatory). Photos should be non-edited. My photo was cancelled once ! · Covering Letter addressed to The Visa Officer, Embassy Of Turkey. · Proof of Hotel Confirmation. · Till date, Personal Salary Bank Statement with Name and Account Number for last 6 months with minimum balance of Rs 80,000/- per head or if company providing their Bank Statement then Covering Letter should state that Expenses for the trip to be borne by the Company(This is Compulsory for all pax). · Copy of Income Tax papers for last 3 years. · Personal Bank Statement of the pax for the last six months. · Copy of degrees and educational certificates. · PCC from Passport Office. I was quite impressed by our airlines Air Astana of Kazaksthan. It won many awards for its service. 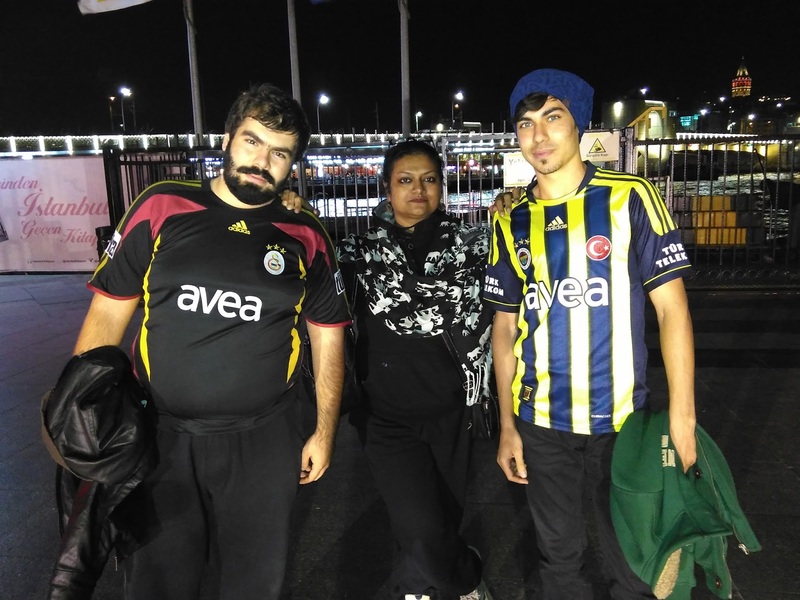 After reaching Istanbul airport - Atatürk Airport at 8.30 pm and after completing our immigration formalities (we did not have check in luggage !) we took a metro from the airport (we bought Istabulkart card at the station) to reach the bus station - where we bought a bus ticket to go to Izmir (then go to Selcuk by Dolmus). After some bargaining we settled for a bus which leaves at 11 pm. The time taken is 10 hours. Some of the famous bus companies are Kamil Koc Bus Company, Metro Bus Company, Ulusoy. I settled for the best ones - since I knew, Kamil Koc, even if some of them are cheaper by 10 TL (1 Turkish lira is Rs 22), tourists have complained that they do not drop the tourists in the main bus stop or Otogor in Izmir (good ones take you to the main bus stop at izmir by a free shuttle car/Taxi - "Dolmus" - from the bus stop, where you get down). 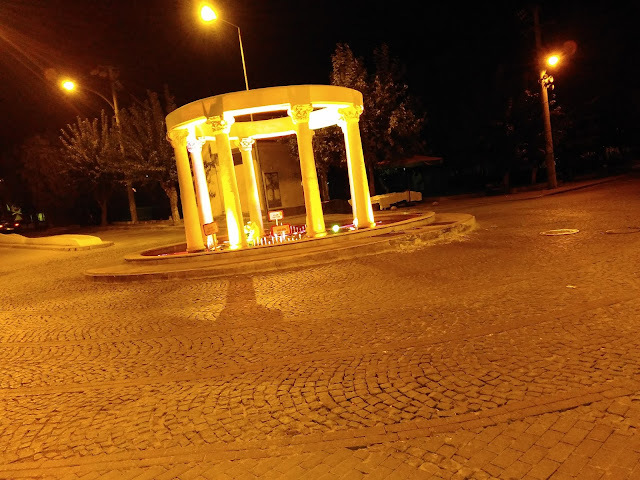 From Izmir you have to catch a minibus or Dolmus (20 TL only for 1 hour journey) for Selcuk (Ephesus is located 4 Km from Selcuk).There are numerous bus companies which takes you to Izmir. So the rates are quite low compared to the luxury (70 TL). They serve juice or tea in the bus apart from water. There is no bathroom though. We got down at Izmir and were transferred to the main Otogar by a free shuttle bus or Dolmus. From Otogar we got a Dolmus (20 TL) to go to Selcuk after waiting for around 15 minutes. Selcuk is only 4 km from Ephes or Ephesus and is a base for visiting the ancient Ionian (Greek) city of Ephesus. Turkey isn’t all about Istanbul, in fact most parts of Turkey are rewarding, no place is overrated. 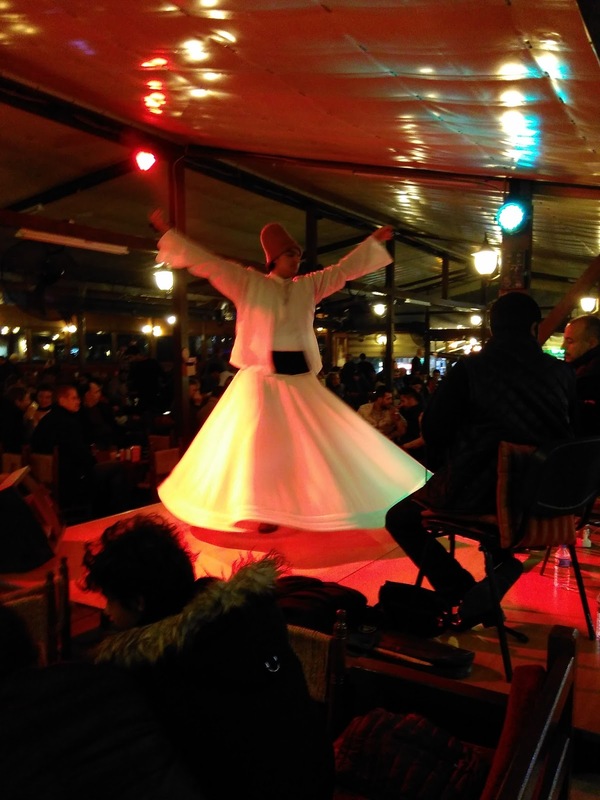 Selcuk is just east of the coastal town of Kuşadası, Selçuk is visited mostly because of its close proximity to the ruins of the Roman city of Ephesus—some of the best preserved in the country. However some tour companies from India make their base at Kusadai. You have to take a dolmus to go there. Our hotel is only 2.5 minutes walk from our bus station or Otogar. The bus is called Otobus (Onibus in Portuguese !). The local otogar of Selçuk is located in the centre of the town. After taking some food (breakfast) from the market (since we would get our breakfast tomorrow at the hotel) and withdrawing some money from the market we left for Ephesus. 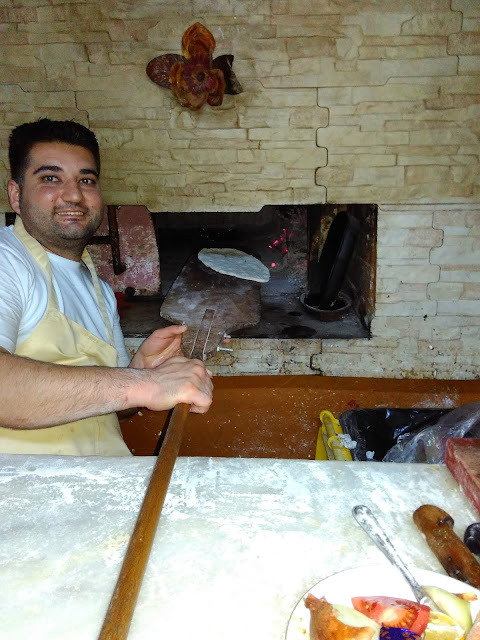 I had Pide ie Turkish Pizza. An old Turkish man took us to the ATM and also helped us to withdraw the money (since everything was written in Turkish) - though he was going to somewhere else! We bought the admission ticket for around 40 TL each (25+ 15 for terraced house) i.e around Rs 900 each ! The ancient Greek city of Ephesus was famous for its Temple of Artemis (near present-day Selçuk), which was recognized as one of the Seven Wonders of the Ancient World. After a messy period of conquest and reconquest and after the population was moved from Selçuk to the present site, Ephesus, became a Roman city in 133 BC. When Augustus or Octavian (grand nephew of Julius Caesar) of Rome made Ephesus capital of Asia Minor in 27 BC, it proved to be a windfall for the seaport city. Its population grew to around 250,000, attracting immigrants, merchants and imperial patronage. The annual festival of Artemis (Diana to the Romans) became a month-long spring fest, drawing thousands from across the empire. Ephesus also attracted Christian settlers (Greeks and Jews), including St. Paul who lived in Ephesus for three years (in the AD 50s) . Ephesus was at its peak during the 1st and 2nd century AD. It was a major Roman city second in importance and size only to Rome. Ephesus has been estimated to be about 400,000 inhabitants in the year 100 AD, making it the largest city in Roman Asia. In 123 AD, the Library of Celsus (third largest library in the ancient world, after Alexandria and Pergamon) was constructed at Ephesus. Despite several dredging and rebuilding efforts, Ephesus' harbour continued to silt up. In 263 AD, Germanic Goths sacked Ephesus, marking the decline of ancient Ephesus as well as the Roman empire. The scenery was perfect here, pine trees, mountains. And ruins nicely nestled among these environments. There are two gates to enter this place. First we went to the largest and best preserved theatre in the Greco-Roman world, the Great Theatre, with a seating capacity of 24,000. On the way we saw some cats moving around - later we got to know that cat is a very special animal in Turkey - you will find cats everywhere in Turkey. The Celsus Library, has two-story facade. When Ephesus governor Celsus died in 106 AD, his son had the library built as his monument and grave. Beside the Library is the Mazeus Mithridates Gate that leads to the Market - Agora (Lower Agora). I took some photographs over there and then we proceeded towards the Terrace Houses. Among all the ruins, the Library of Celsius was truly a masterpiece. The theater was huge. The reason why Ephesus stands out among all other ruins is because Ephesus has some beautifully preserved villas from it’s heyday. 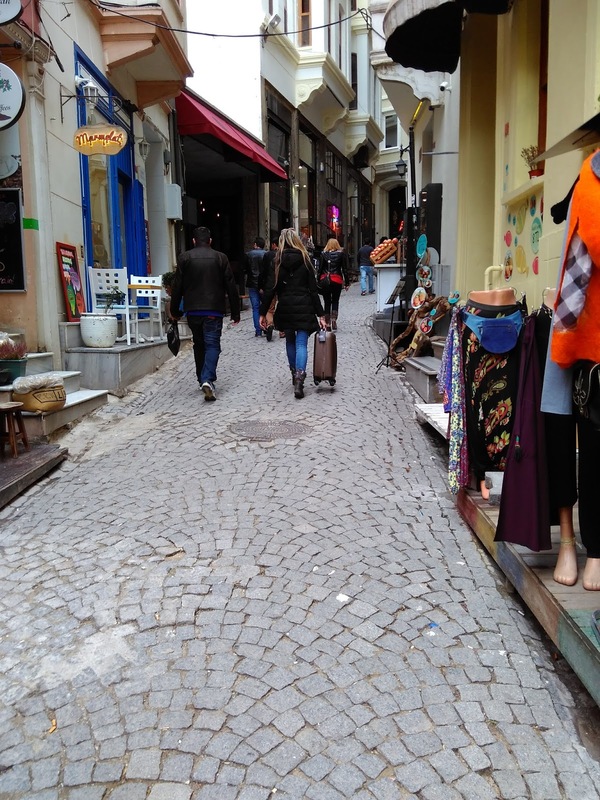 For the terraced houses we had to pay extra 15 TL. These residences ( 1C AD) of the wealthy are the most beautiful examples of peristyle houses and each with its own heating system and bath, were as comfortable as houses are today. 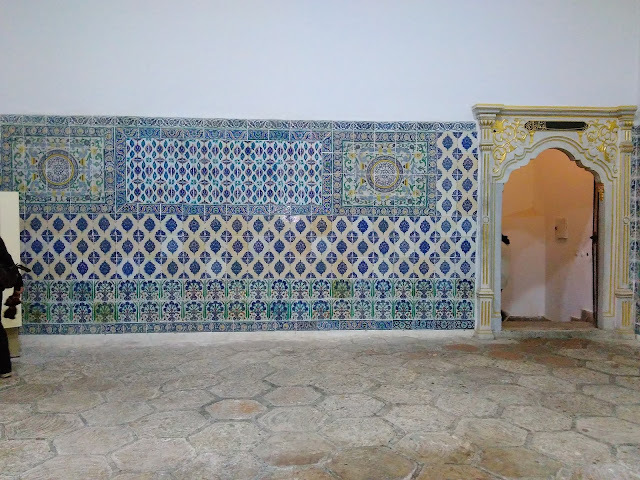 They all had exquisite frescoed walls and mosaic floors, being painstakingly preserved by an Austrian-Turkish archaeological team. These houses are really well-worth seeing. In recent years, the highlight of a visit is also to these exquisite Terrace Houses apart from the Great Theater and the Library of Celsus. When we went there the restoration work was going on. I had an eerie feeling thinking what they were doing 2000 years back. Then we took the Avenue of the Curates - cobblestone road and we saw the latrine and then went on to see another small amphitheatre where the Council of Ministers used to meet - it is not as big as the first one. There is no water inside this place - so you have to carry water before coming here. You can easily spend around 3 hours here. After spending some time it was time to go back to Selcuk. 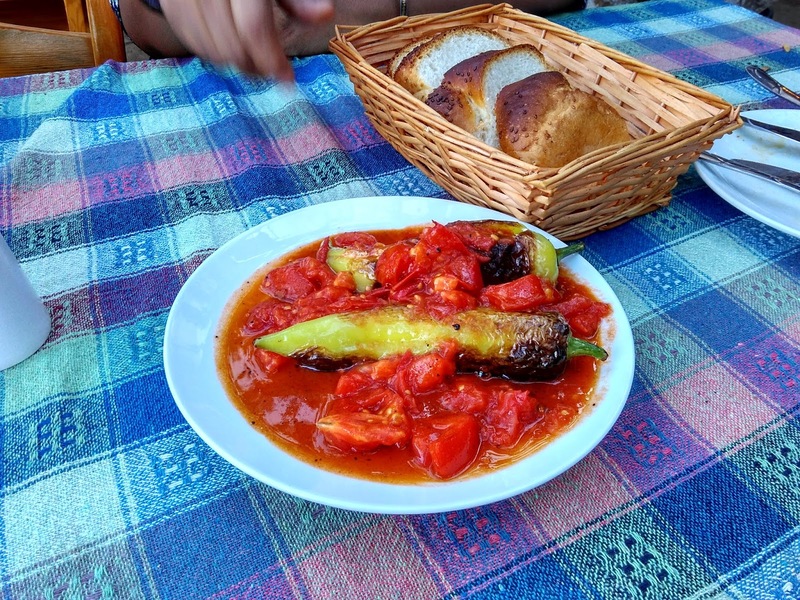 We were quite hungry, but the moment we reached there we saw a Dolmus going to the hill town of Sirince - this is a place where many vineyards are located; this place is famous for its wine. So jumped from one Dolmus to the other Dolmus. It's a charming small quaint town - every half an hour there is a Dolmus which is going to Selcuk. When we reached it was around 3pm, we were quite hungry - but that is a small price you have to pay - if I have to cover many places ! 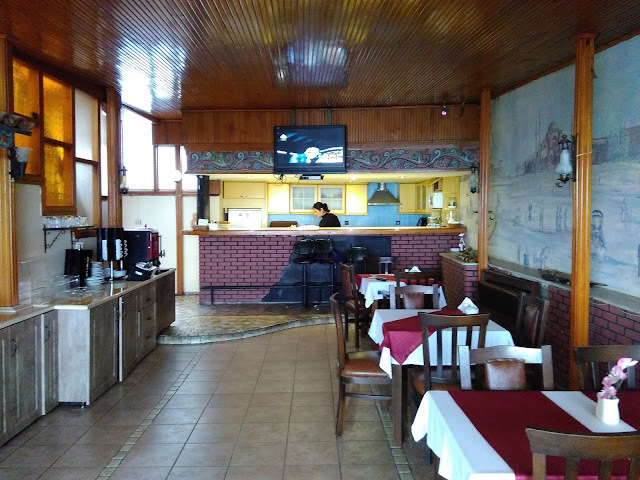 Initially we planned to have our lunch in Selcuk, but in that case we would have missed Dolmus going to this town of Sirince. Şirince is a village nestled on the hills in Central Aegean Region, Turkey. 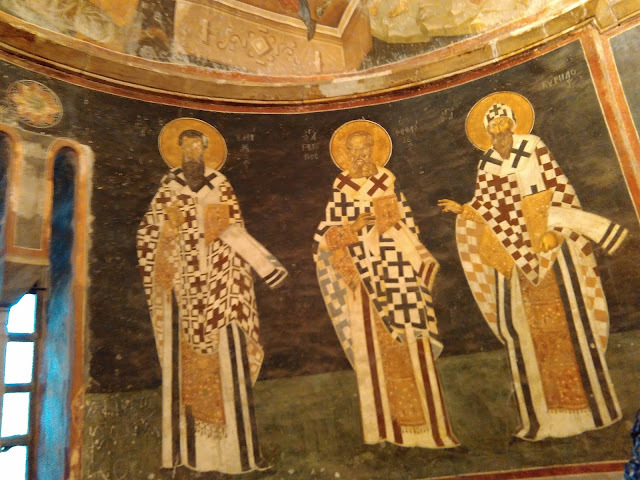 Sirince was a Greek village before the Greco-Turkish War. In 1923, Turkish and Greek governments exchanged populations. The Turkish government exiled Christian Greeks of Turkey to Greece, while Greek government exiled the Muslim Turks of Greece to Turkey. Şirince today is very popular with Turkish tourists, especially on weekends when it can become packed. 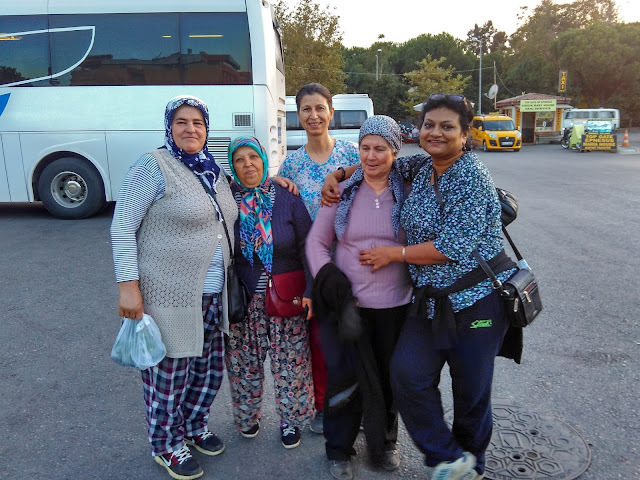 From Selçuk town (8 km away from Şirince), you can take Dolmus/ minibuses to the village, which cost 3 TL. Şirince is very small hilly town and it is easy to walk around the village. 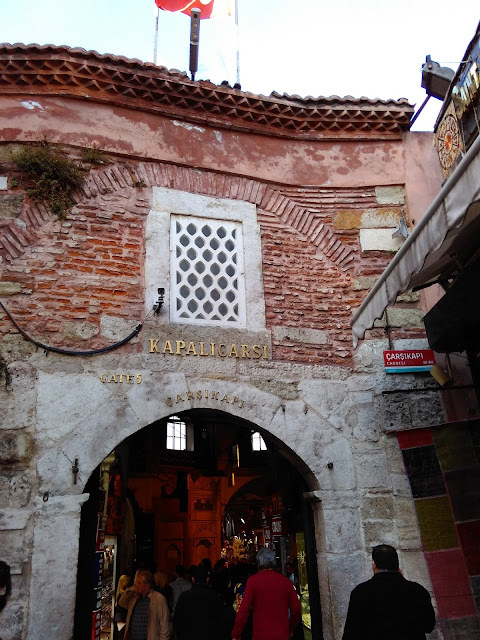 Sirince's local architecture is quite well preserved and worth a look. The village is quite a heaven for the photographer. Apart from the historical background of the village, there are fantastic valleys to walk around. Olives, peach gardens, vineyards. It’s Turkey's Tuscany. After reaching there we had the famous pomegranate juice over there. Then we started walking around. In the Town we saw a wine cellar where some old wines where stocked. We went inside the cellar. There is also at Church inside the compound of wine cellar. While walking we saw many people selling different Handicrafts. Now we were really tired and hungry. So we decided to head over lunch there. I had Yeprek Sarma - it is a spring roll covered with grape leaves. We really liked it; the restaurant was located in a very nice place overlooking a valley. All throughout the village there are shops where you can put your wine tasting skills to the test. There are some nice hotels there. Mohua bought some souvenirs here. 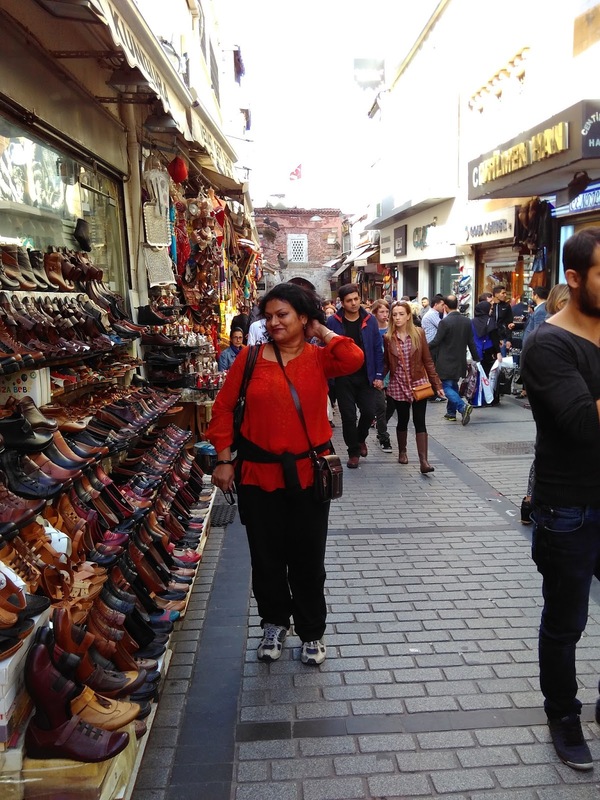 After strolling around for some more time - we decided to go back to Selcuk . After reaching we met some local lady in the dolmus whose caller tune is Awara !! After returning to our hostel we refilled our water bottle - otherwise we would have to pay 2.5 TL . After refilling we started walking around the city. It is a very small city it can be covered by foot - there is no need to hire a car . 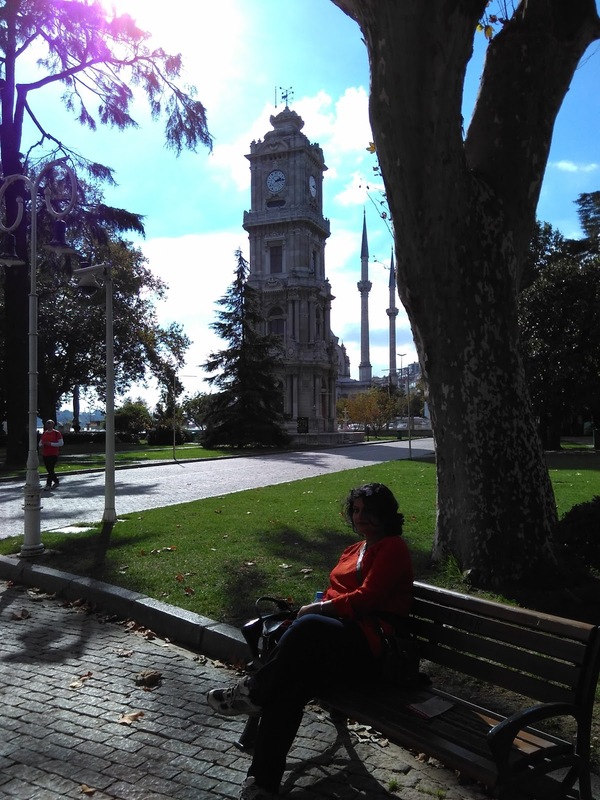 The town of Selcuk too was a delight, it houses the only surviving column of the Temple of Artemis, it has amazing Fort, the Ayasoluk Fort and an old surviving church, the St.John’s Basilica. A very picturesque town with farmlands and history strewn all over. 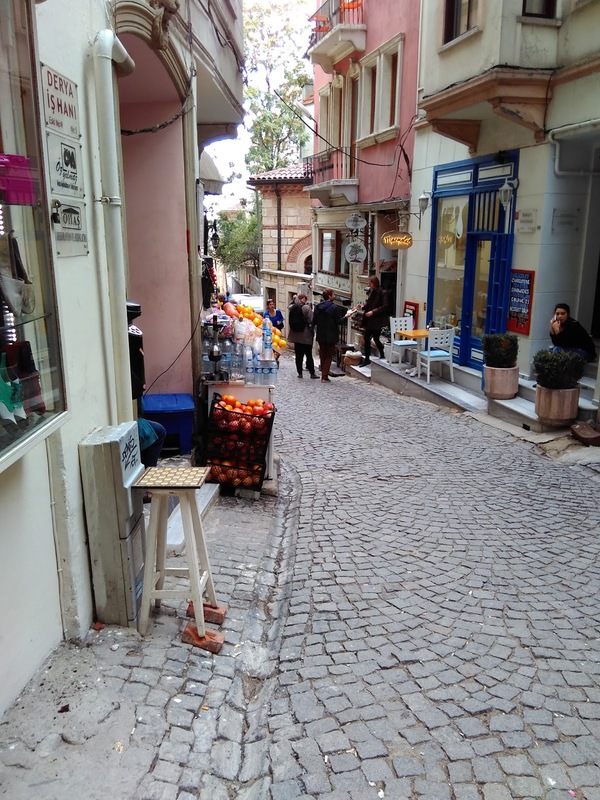 And it was a “real” town, not a tourist one, so you get to see Turkish men spending hours at Kiraathanesi’s, or tea houses and you get to taste plenty of local food at great prices too. All along the Boulevards there are numerous cafes; we decided to sit beside a musical fountain and had some tea and sweets . 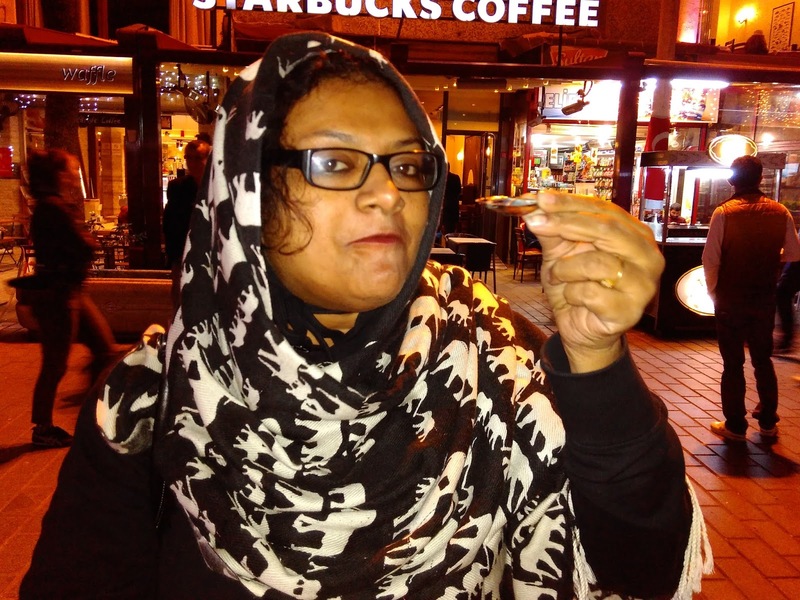 You will get sweets and tea everywhere - just like what we get in Kolkata. Mohua had had dinner in a roadside eatery which is extremely clean and the owner of the stall Mr Ali is an amazing person. He knew that we are from India and he gave us more than what is there in the price list (although we have prepaid our bill before eating - so he knew that he cannot charge anything extra) ; he even served us some wonderful Turkish tea free of cost . So I decided to pay him more money, which he took reluctantly. We can see he did not have too many customers on that day. While walking around the city I saw a shop with for selling beef Salami. 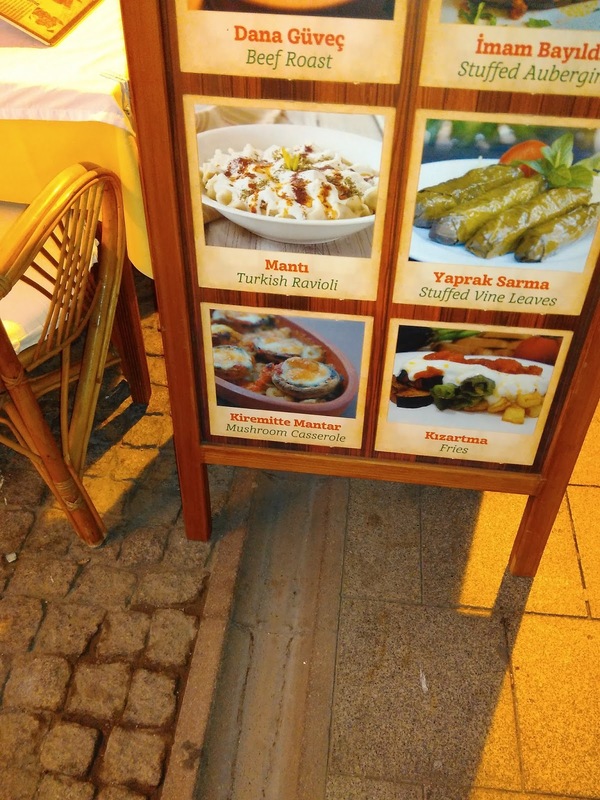 It was really nice and the salami in Turkey (beef) is very good generally. It was a hectic day - so I call it quits and decided to go back to our hostel. Today we got up early in the morning since today we will catch a bus to go to Pamukkale at 9 am. It takes around 4 hours to reach there. 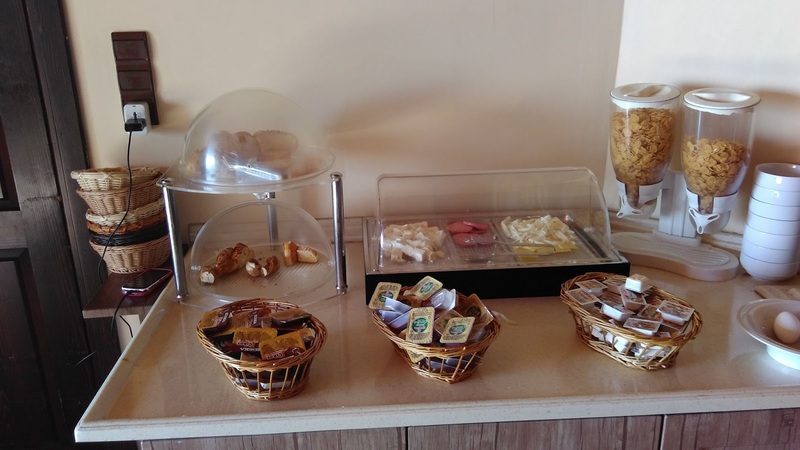 We had our breakfast at the hostel (it was bread and breakfast - I invariably book in such a hostel) the food was sufficient for us - although the spread was nothing special. Of course you cannot expect a very special spread at this price. Here they give a basket of bread - you can ask for refill - you can have as much as you want. We bought the bus ticket to go to pamukkale yesterday. The bus station is very near to our Hotel - so we walked to the bus station with our luggage. But the bus was almost empty- so the bus after traveling for 1.5 hours stopped at a place called Aydin (actually a bus station) and we had to wait for around 1.5 hours for the next bus to come with more passengers. So we were stranded for 1.5 hours almost. The bus station is really nice- it looks like likes an airport and there is a Shopping Centre inside. They were selling halwa,various sweets. 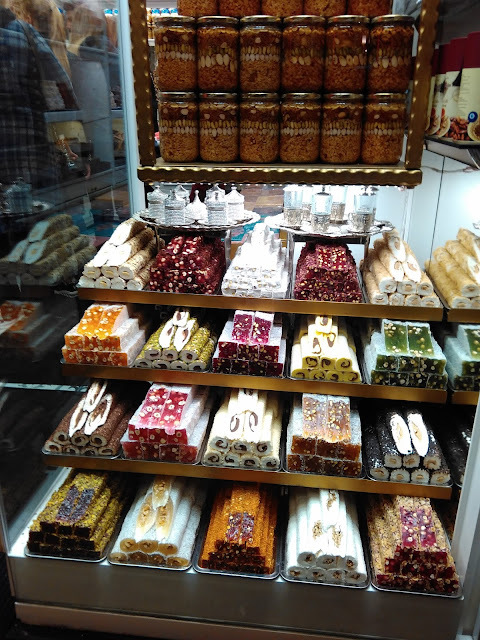 The sweet seems to be very popular in Turkey. Anyways we reached Pamukkale a little late, because of this break . After reaching pamukkale we kept our luggage in the bus company's office because our bus to Cappadocia is at night. Actually the Bus from Selcuk doesn't go directly to Pamukkale. We have to get down at Denizli town. In fact most of the buses go only upot Denizli. From Denizli town there is a shuttle service to Pamukkale. Since we booked from a good company there's a free shuttle service to the bus company's office in Pamukkale. One interesting thing in Turkey Bus fare is similar to plan fare almost. Since we were hungry - it was late - so we decided to take our lunch first . The lunch was a bit let down (we had Turkish Pulao) . But we took some interesting photos from the restaurant. After buying the ticket (25TL i.e. Rs 550/-) at the counter be started walking barefoot (that is the rule there - as a pollution control measure - so the “travertines” stay white as ever. - so bring something to put your shoes in ! 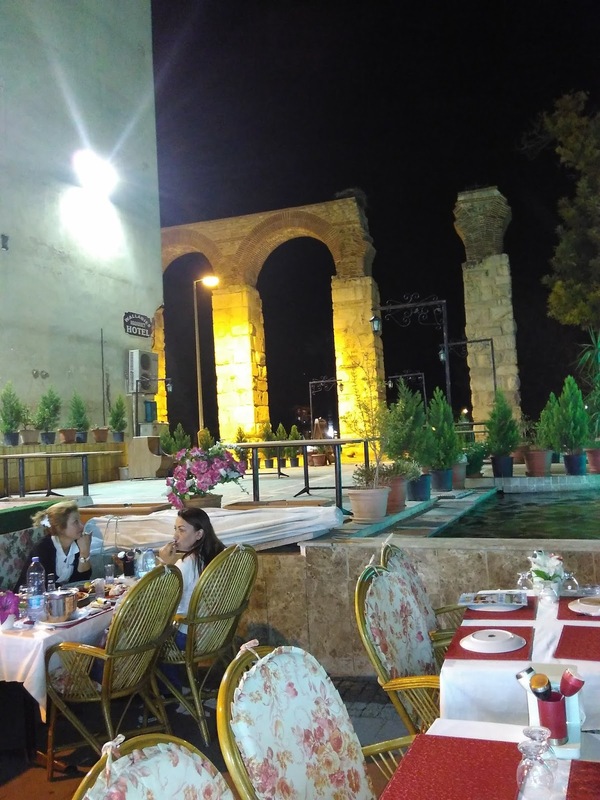 ).This price includes admission to nearby Roman city of Hierapolis as well. On the hill filled up with calcium carbonate formation. If you look at the photograph you will think it is cold - it's not actually cold. This calcium carbonate formation is called travertine. There's a wonderful view of the city from that Hill. We took some pictures at the travertine. We have never seen such a unique landscape. 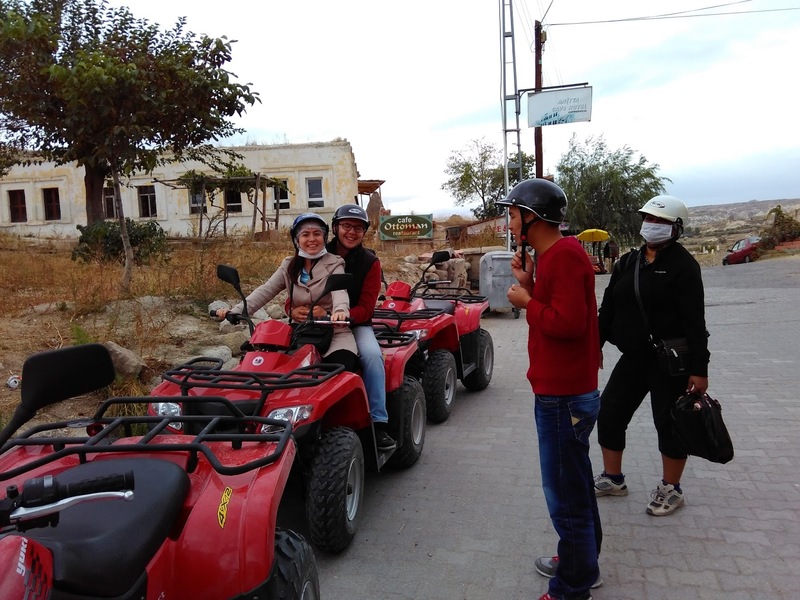 You can avoid the climb and take a taxi to the top of the hill and enter from the other side of Hierapolis. But the real charm of the place lies in experiencing these travertines. These petrified waterfalls/travertine are a UNESCO World Heritage site. The great (12,000 seater) Roman amphitheater of Hierapolis should not be missed and lies just above the travertines. It is really stunning. Even today performance takes place over there. Hierapolis was an ancient city located on hot springs in classical Phrygia in southwestern Anatolia. Its ruins are adjacent to modern Pamukkale in Turkey and currently comprise an archaeological museum designated as a UNESCO World Heritage Site. The hot springs have been used as a spa since the 2nd century BC, with many patrons retiring or dying there. There are only a few historical facts known about the origin of the city. No traces of the presence of Hittites or Persians have been found. The Phrygians built a temple, probably in the first half of the 3rd century BC. This temple, originally used by the citizens of the nearby town of Laodicea, would later form the centre of Hierapolis. It is also worth making the effort to get to the remains of the ancient city of Aphrodisias—one of the best preserved Roman sites in southeastern Aegean. You can rent a van from Denizli to get there. Local bus companies will arrange bussing for 30-40 TL. For lack of time we had to skip this. You can also take bath in the mineral hot springs. This is an enclosed pool, with additional entrance fee of 32 TL . Hierapolis became a healing centre where doctors used the thermal springs as a treatment for their patients. After crossing the Trevertine, the Roman amphitheatre is on the right and the necropolis of Hierapolis is on the left (road becomes like a fork here). After getting down from the amphitheatre we proceeded towards the necropolis. We have read necropolis in your school books - but I never seen necropolis . we saw some inscription written in Greek on the necropolis - we found it fascinating. We can see many Graves all over the place. We saw a big entrance at the end of the necropolis - we got to know that in those days when people used to come from outside - just in case they were carrying some germs they were supposed to take bath before entering there. So by the time we finished our Hierapolis tour it is gradually becoming dark, so we had to rush to go back to the bus office. We met a Bengali lady who has come here through Cox and King tour company. From Heieroplis , again, we reached the travertine - we have to take the same route. But it was already dark .Because of the water seepage things are bit slippery - so we had to be very careful while returning back to the ground. There is some lighting arrangement at the Travertine – but that is not adequate. Since there was enough time - so we started exploring the town - where we can have some good dinner at reasonable price - so finally we zeroed in a restaurant, where we took our dinner - then it is time to catch the bus to go to a place called Cappadocia. First we went to Denizli. Then we took the bus from Denizli to go to Gerome. When we got down at Gerome it is around 7 am. Interestingly from the bus stop at Gerome we can see our hotel. It is located at a wonderful location. From Gerome you can take various tours - green tour, red tour across Capodoccia. Cappadocia (Turkish: Kapa-dokya) is an area in Central Anatolia in Turkey best known for its unique moon-like landscape, underground cities, cave churches and houses carved in the rocks. 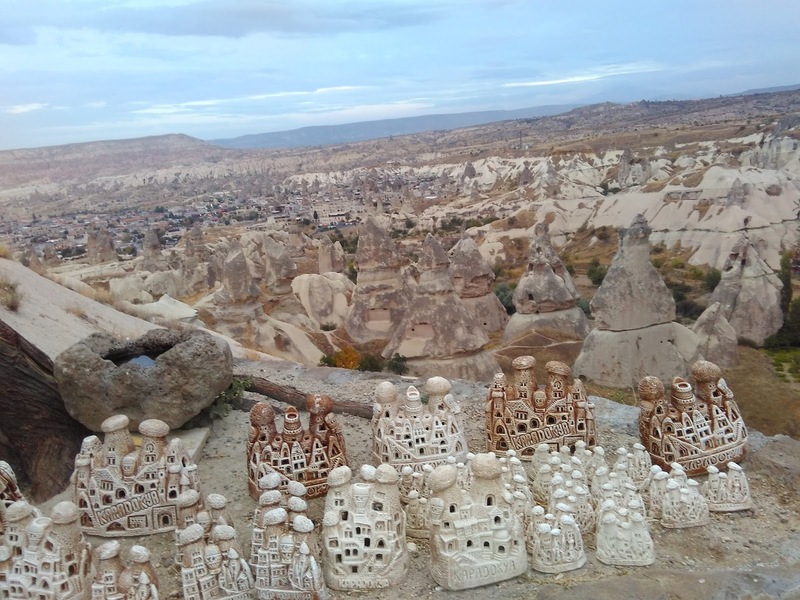 Goreme (pronounced guh-reh-meh, uh like er in "her") is a town in the Cappadocia region of Turkey. These natural rock formations are often called "fairy chimneys". The rock shapes were conducive to build cave houses and these were built by Hittites and early Christians escaping Roman rule. Romans,the Pagans, did not like the the Christians, who are not Pagans. People still live in the rock houses or use them as storerooms today, displaying an immense reverence for this volcanic earth and history. 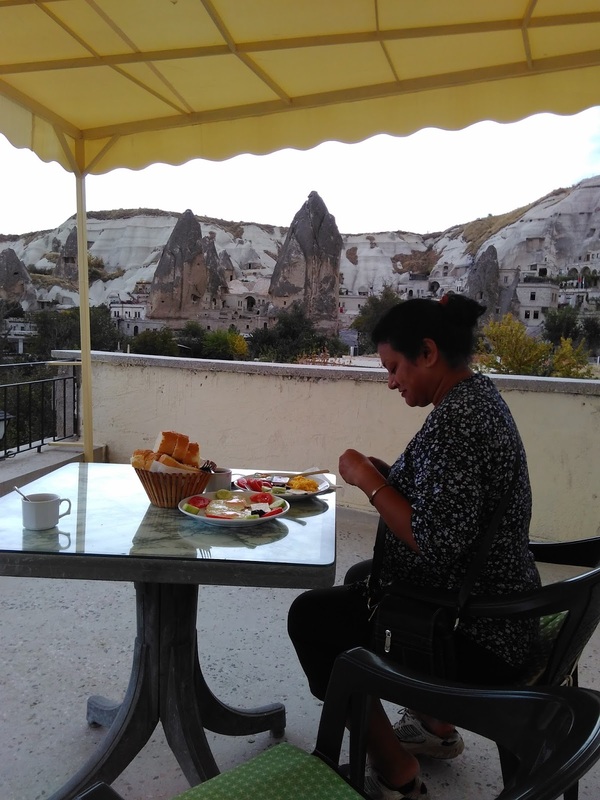 The village of Göreme does not only have rock houses, but also rock restaurants and rock hotels - which all visitors find amazing. In fact I am so fascinated by Gerome that if somebody tells me to visit one place in Turkey, probably I will say please visit Capadoccia ! It is that good. 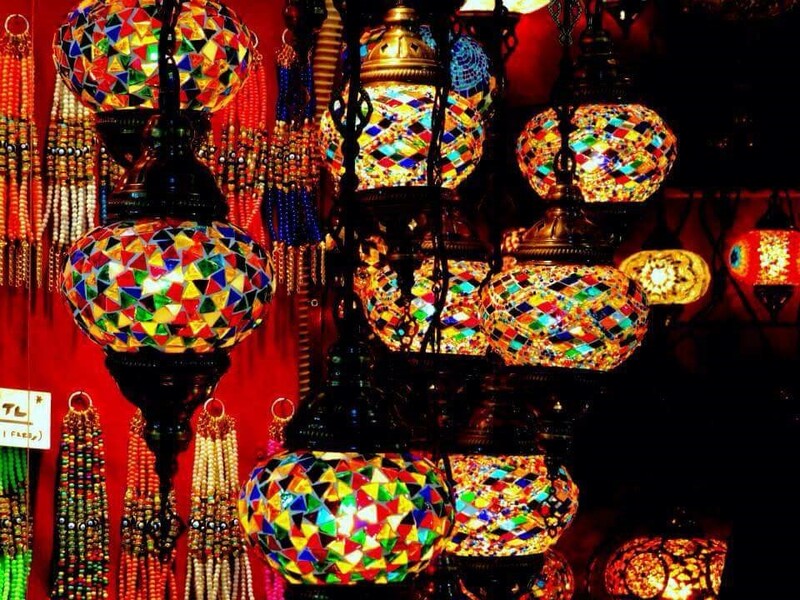 Please remember Istanbul is irresistible ! · Göreme — Cave Houses built into the Fairy Chimneys. 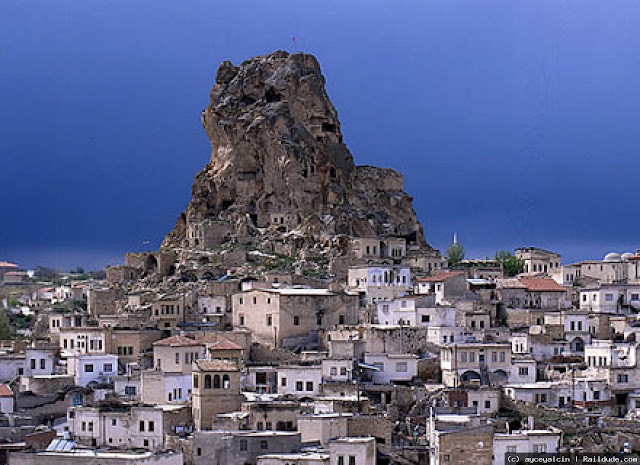 · Uçhisar — The highest point of the region with it's natural rock castle. · Avanos — Pottery town which is divided into two by the longest river of Turkey (Kızılırmak). It is simply one of the most stunning places I have ever seen. We walked towards our hostel. It is located in a wonderful location overlooking the valley. We quickly had our breakfast and I went ahead to book the Green tour. Red valley tour is almost a scam according to LP, since it can be covered by foot. So after I booked the Green tour (after visiting at least 7 travel agencies office to get the rock bottom price) for 100 TL , we boarded the mini bus in front of the travel agencies office. There is also a blue tour. The 16-seat van picked us up at the booking office in front of our hotel at around 9:30 am. We went around Göreme stopping at few hotels to fill up the van. Finally the tour guide hopped on, and we set off close to 10 am. Our tour guide was a phenomena - smoking electric cigarette. Our group consisted of me and my wife, few Koreans, a couple from Argentina, a French couple and other people whose country of origin, I cannot remember. The couple from Argentina was very nice and we chatted a lot (the man works in Argentinean embassy in Mumbai !). Its itinerary goes as the following: Göreme - Derinkuyu Underground City which is the biggest and the deepest one among 100 underground cities all around-Ihlara Valley, the longest one in Turkey - Selime Monastery, the biggest rock-cut monastery in Cappadocia, which inspired George Lucas to create the scene in Star Wars - Pigeon valley -onyx factory. It would have been difficult visiting so many far flung places on my own. The landscape changed as we moved away from Goreme, and it was quite spectacular with plenty of grasslands and mountains . 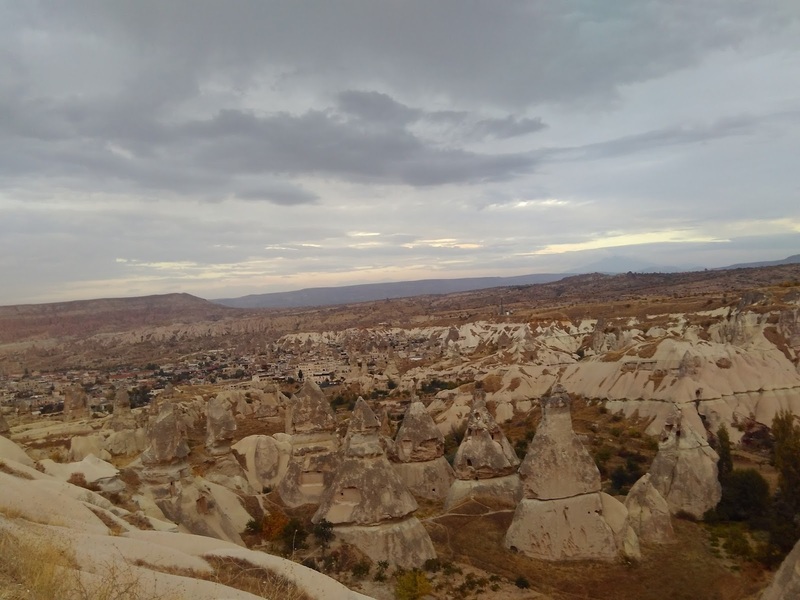 I realized Cappadocia isn’t all about the rocks and caves. The first stop was 35 minutes away in Derinkuyu for the underground city. 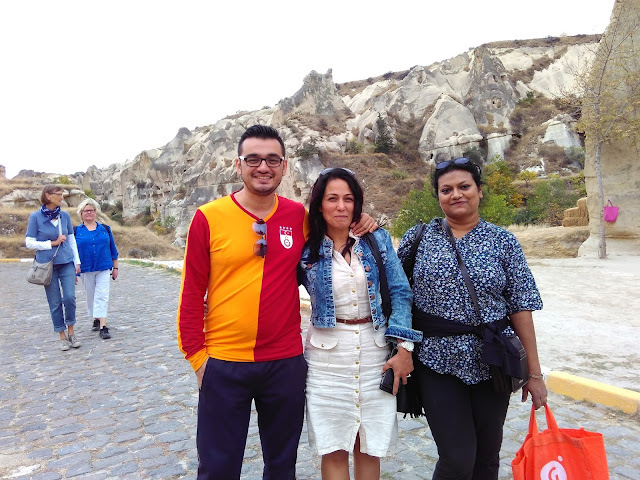 Our guide took time to explain some of the history of Cappadocia, asked everyone their names and countries of origin and prepared us for what to expect in Derinkuyu. He started at the ventilation shaft above ground and then took us into the climate controlled underground tunnels. Only 25% of the troglodytic city is open to the public and excavations are ongoing. The Derinkuyu underground city has at least eight levels .The underground city is approximately 85 metre deep. It contains all the usual rooms found in an underground city (stables, cellars, storage rooms, refectories, churches, wineries, meeting rooms , a well, a grave, and a kitchen. etc.) Historians guess that up to 2000 people could have lived in the city at one time. Apart from these, a large room with a barrel vaulted ceiling on the second floor was a missionary school, the rooms to the left being study rooms. From the 3rd and 4th floors onwards the descent is by way of vertical staircases which lead to a church on the lowest floor. These were used by early believers of Christianity to escape from Romans / pagans. The guess is that it was used only during invasions to hide from enemies and only for a couple of months at a time. The structure dates back thousands of years. Underground Cities were excavated as early as Hittite times, and expanded over the centuries. Apparently, the Hittites used the first two floors for their animals. Over time the different local inhabitants dug deeper and deeper. They say that every house in the town has a basement that connects to the subterranean metropolis. The above ground invaders must have wondered if they had entered a ghost town or magical land with disappearing people! 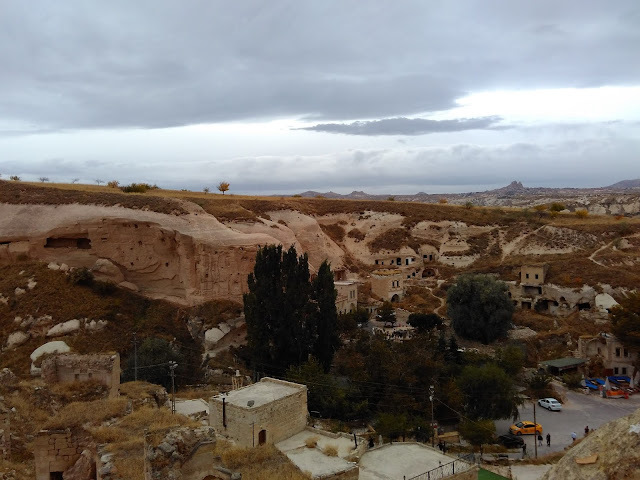 Given that Cappadocian winters are quite harsh (this region was once called the “Land of Snow”), wood is scarce, and the temperature underground is steady throughout the year, I wonder if the locals used the underground areas in the winter as an easy way to stay warm? 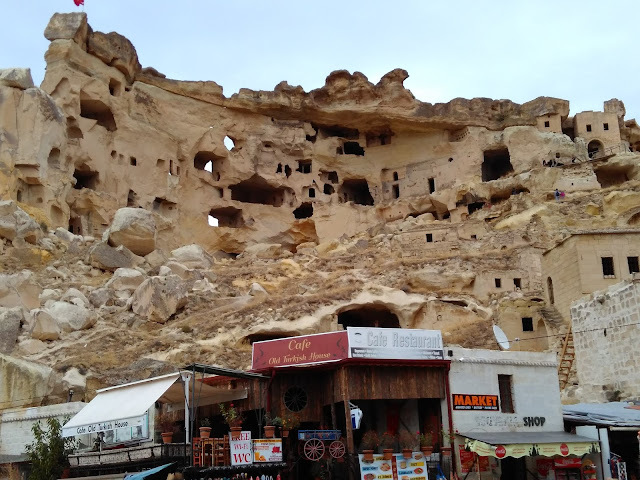 There are 36 underground cities in Cappadocia and the deepest one is Derinkuyu underground city, while the widest is the Kaymakli Underground City. 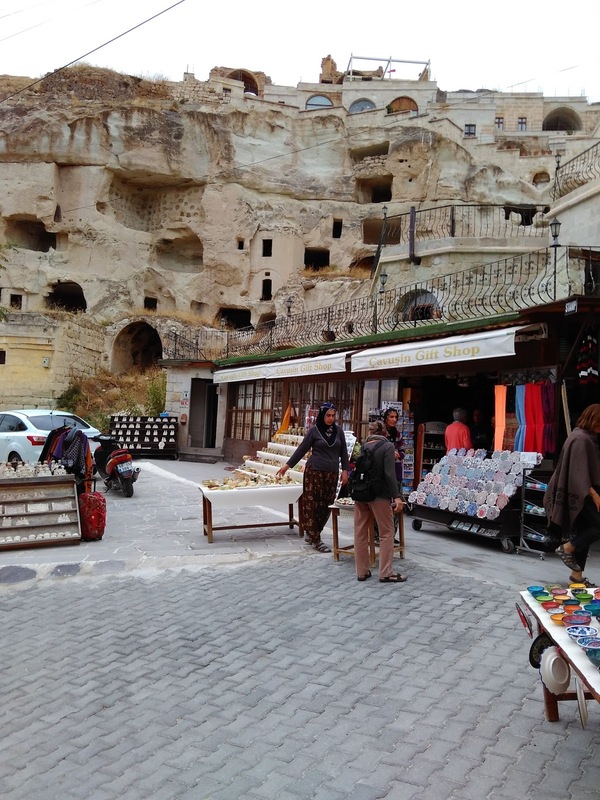 The Derinkuyu underground city is located in the same named town Derinkuyu, which is situated 40 km from Goreme . We had few minutes to look around after returning to sunlight and then were off for the 30 minute ride to Ihlara Valley, a lush, green river canyon . The valley is 14 km long, and we were dropped off at about the 3km point. 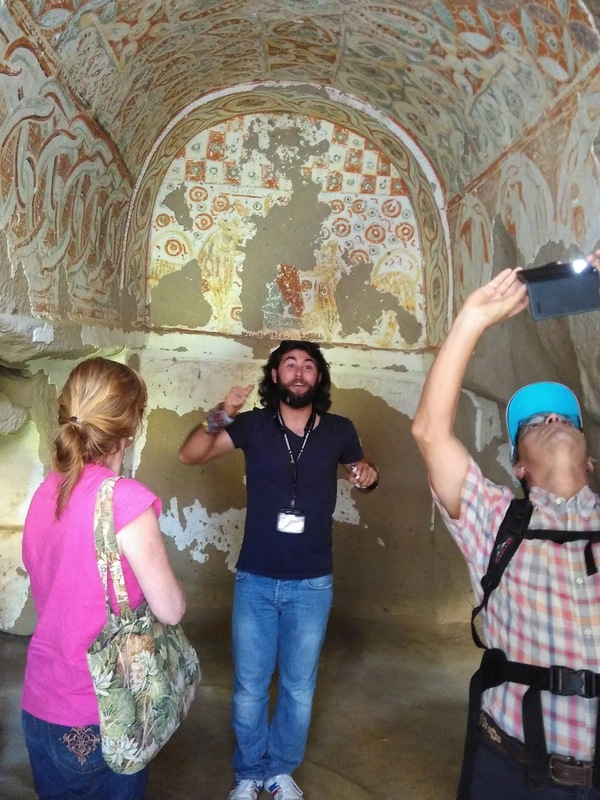 After descending a couple of hundred stairs to the canyon floor, our guide showed us the Ağaçaltı cave church dating to the 4th century with paintings from the 10th century. After that we freely followed the flat, winding path along the river surrounded by towering cliffs. 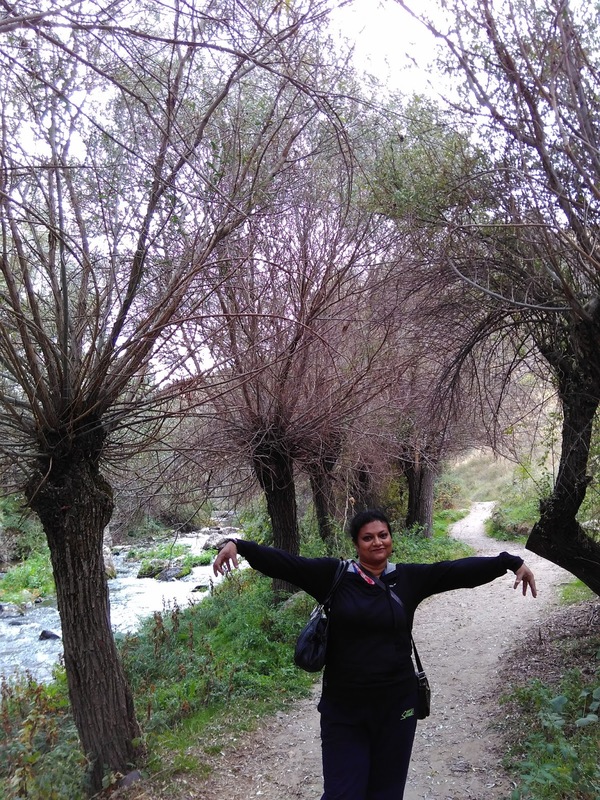 The 3-4 km walk was a pleasant one along the river, I never expected this kind of landscape in Turkey. After 3-4 kilometers we stopped at a riverside restaurant for lunch which included soup, salad, and a choice between, trout, chicken, vegetarian, or meatballs. Drinks were extra (a can of juice cost 4 TL and a half-litre bottle of water was 1 TL). Back in the van and 25 minutes later we arrived at the base of a cliff towering over an old Greek village and some cone-shaped rocks. Little could we have suspected what awaited us. We ascended the steep lower section of the mount past the first couple of fairy chimney formations from whence our guide gave us the general layout of the monastery and gave us half an hour to explore. The monastery dates from the 8th-10th centuries and included a missionary school, a living area, and at least one church. The rooms are massive with carved second floors and balcony levels. We saw the famous “Star War's” movie’s fairy chimney from the top. After descending back to the parking lot we began the hour long drive to Pigeon Valley during which everyone enjoyed a nap. We were given 15 minutes to take pictures of the valley and Uçhısar rock tower/castle, look at the evil eye tree and shop for the souvenirs - we had seen at every other stand along the way. 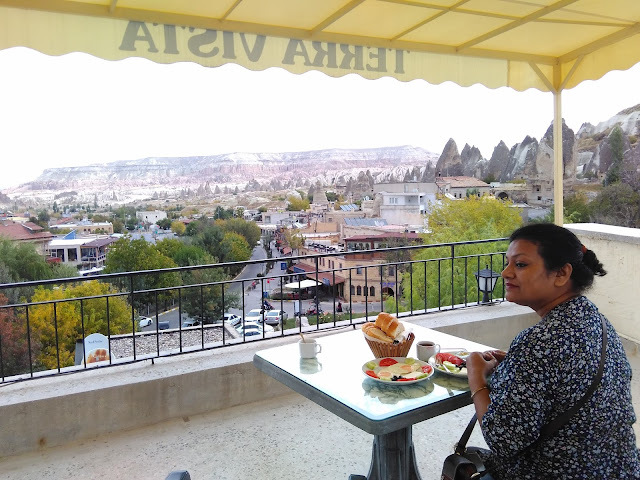 The view is breathtaking making it clear why Göreme is unique in the world and the most popular place for overnight accommodation in Cappadocia. Our guide gathered us again and we crossed the street to the Onyx jewelry factory. It began with a demonstration of carving a piece of white onyx on a lathe into the shape of an egg. Afterwards we were free to tour the sales room and look at beautiful, overpriced jewellery. Next one is the panoramic view. 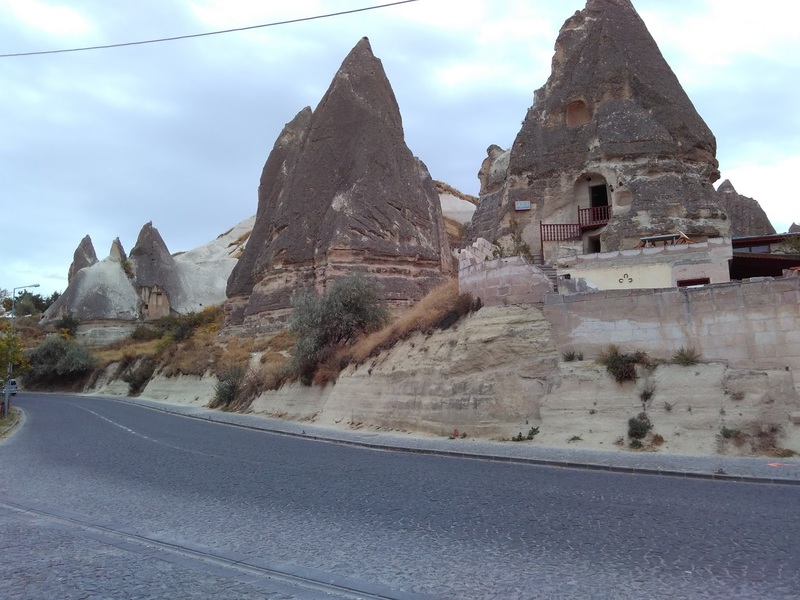 Down the hill, and we were back in Göreme being dropped off at the hotel. I looked at my watch and it read 5:00 pm. The tour could not have gone better; it included the perfect number of attractions, we never felt rushed or bored . 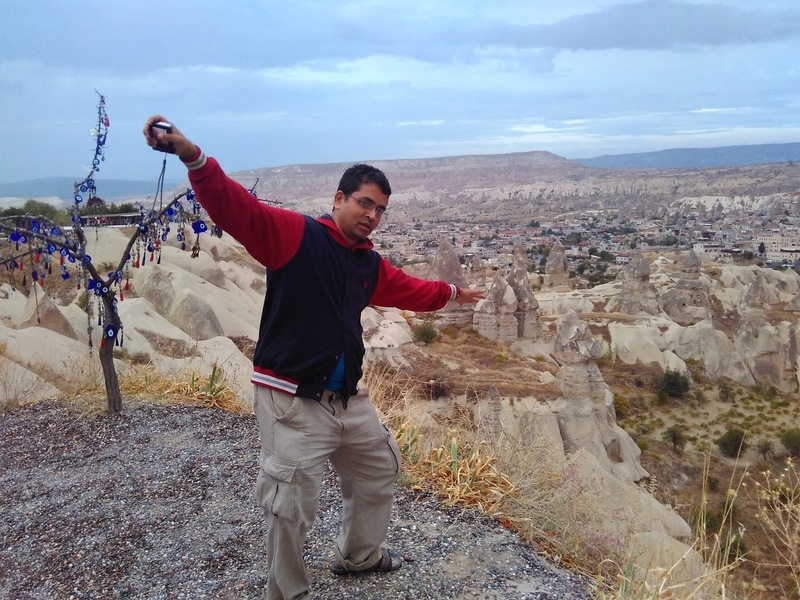 In short, I will recommend this tour on your visit to Cappadocia. Add the Göreme Open Air Museum on the next day and a hot-air balloon ride and you have seen the essentials of a Cappadocia visit. After returning Mohua decided to watch famous Turkish Night and we booked out ticket immediately. Our car came at 9 pm and picked us from the hotel. It is part of the package. It was an amazing experience and along with the dance there is free food, drinks - soft and hard ! 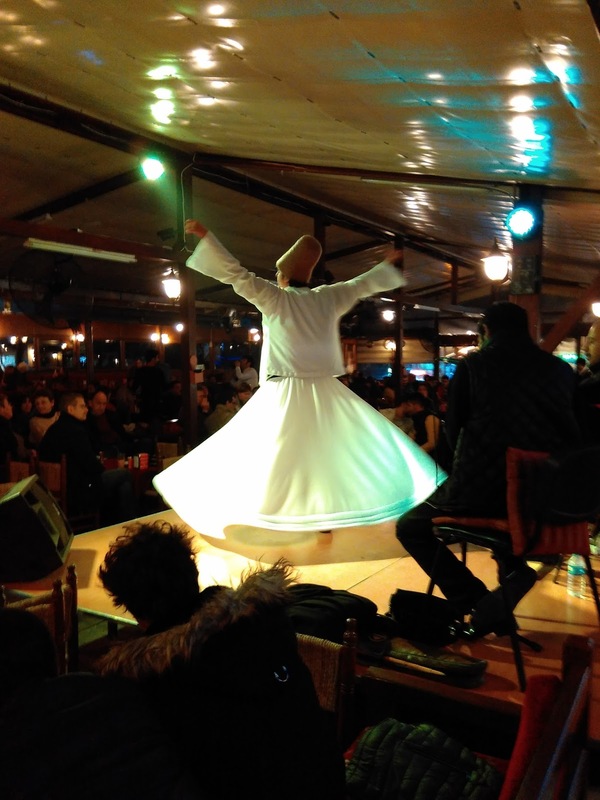 It is a complete package with Dervish dance, Belly dance. It was seen to be believed, how they have marketed the whole thing. The place is completely SOLD OUT with tourist. I hope one day I can promote my state like that - which has much more to offer than this! After breakfast I planned to go for the Open air museum. The breakfast served was adequate and enough for us. We had the breakfast at the rooftop. The view from the rooftop is quite simply stunning and undoubtedly one of the best veiws ever ! Today what we planned is essentially part of Red tour. North Cappadocia tour also known as Red tour is a great itinerary which covers all highlights of the North Cappadocia. 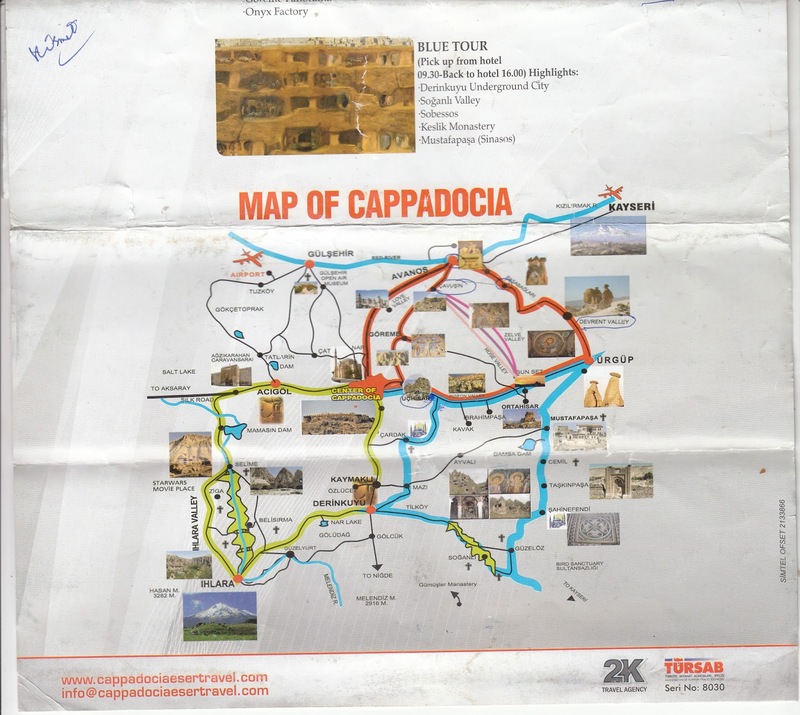 When combined with South Cappadocia tour at second day, two tours would cover all Cappadocia's highlights. But Red tour can be done on your own without the help of any tour company at your own pace. Unlike Green tour it is not so spread out. 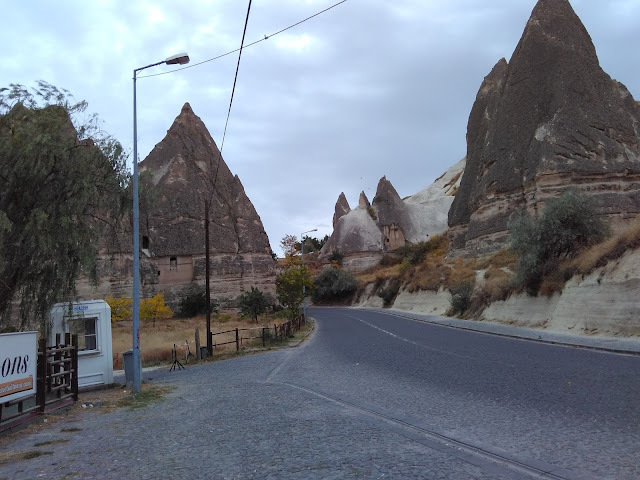 First we walked for 1 Km to reach Göreme Open Air Museum. The whole route to the museum is so stunning it beyond my capacity to express it in own words. Let the pictures speak for itself ! Even photograph will not be able to do justice. It is not a museum ! The museum has a collection of caves and fairy chimneys and churches. Be sure to visit the church in a cave across the highway outside the museum entrance, which is included in museum admission (save your ticket). It is indeed an amazing place. However, today no photography is allowed inside the caves. There is a church called - Dark Church and carries an extra 8TL charge (not included in the tour cost). I recommend paying the extra amount. The paintings are stunning. 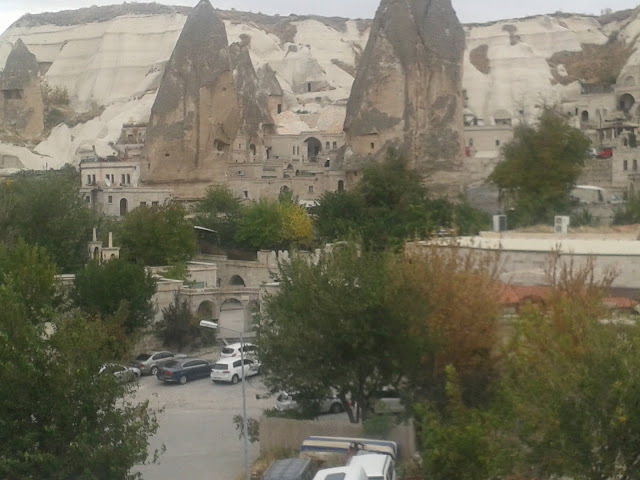 Goreme, an important Christian centre in the early years of the middle ages. Despite the vast number of monasteries, churches and chapels in the vicinity of Goreme, there are not many inscriptions bearing dates. For this reason these religious buildings are mainly dated according to the iconography or architectural features. After spending quite some time we suddenly met Mr Manoj Banthia - Mohua used to work in his firm after passing out CS. It was really pleasant surprise. Because of bombing one month back in Ankara they have gone to Greece instead of Turkey and changed their plan to come to Capadoccia only other than Istanbul. Like us they have not taken any organized tour ! We have hardly seen any Indian in this tour of Turkey. We had some amazing ice cream near the open air museum. The ice cream and ice cream sellers antics are very famous. We thoroughly enjoyed the way they serve it. What a show ! click here for the amazing show ! Then we started walking towards Cavusin village. On the way we saw some Car ATVs. So I hired the ATV to go to Cavusin. We were following a guide. 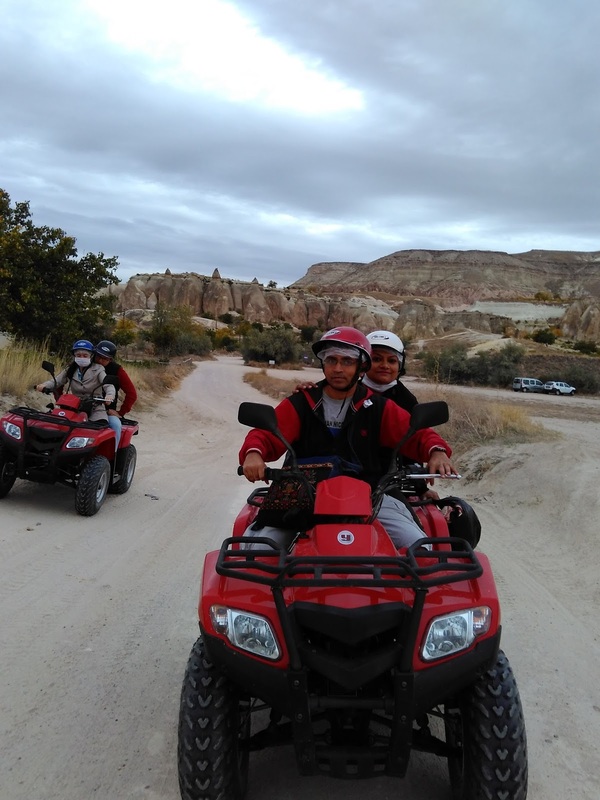 Initially I had some problem in managing the ATV - because I have never driven an ATV. We were joined by a newly wed couple from Ankara. The owner of ATV let us practice for some time. Two persons can sit in an ATV. We hired it for 1 hour for 100 TL approx. Cavusin is one of the oldest settlements in the area. Cavusin is situated 2 km from Goreme, on the Goreme – Avanos road. 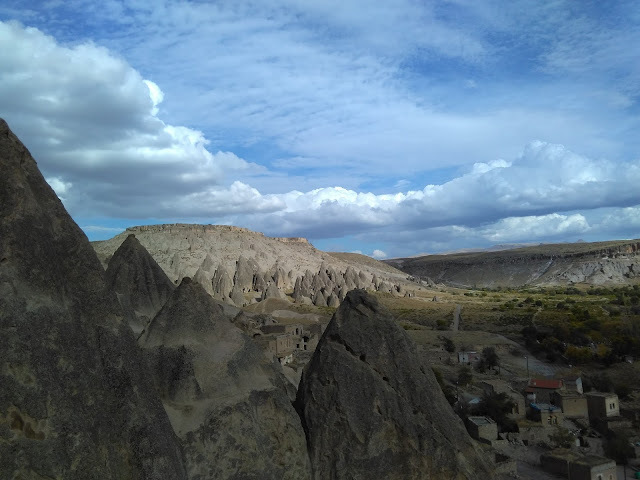 Çavuşin village, located about halfway between Avanos and Göreme, is surrounded by a valley which becomes gradually wider, allowing extended farming. Until the 1920s it had a mixed population with many Christian Orthodox families. 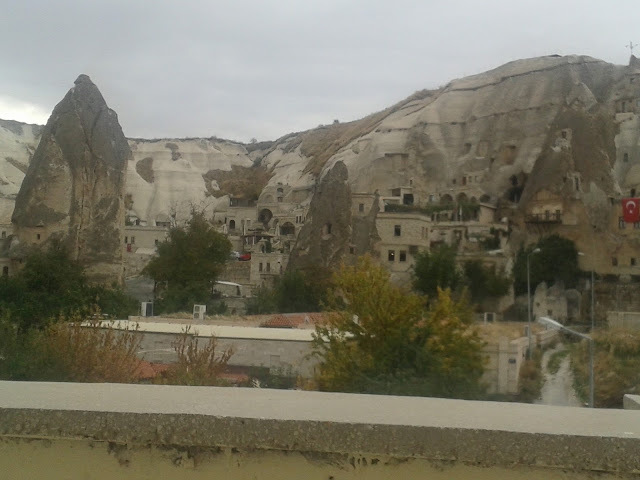 The old village, which was abandoned several decades ago due to rock falls, was all carved into the hillside. 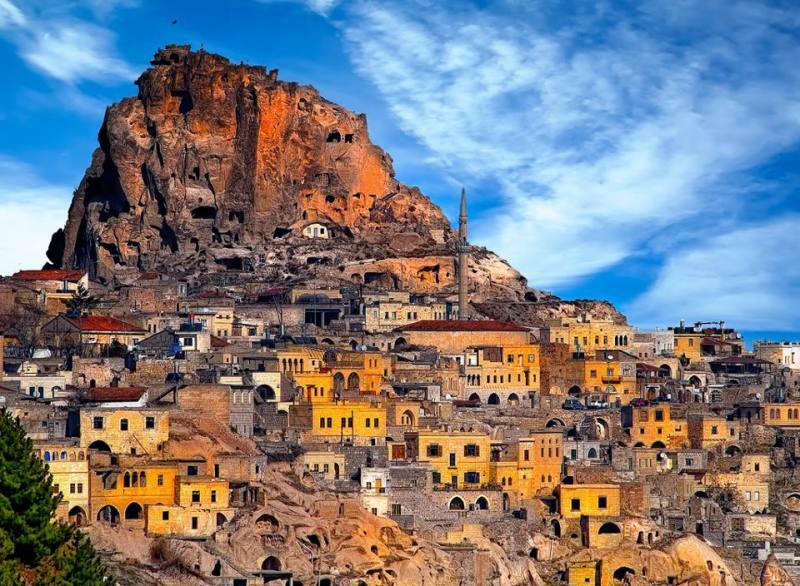 The inhabitants of Çavuşin lived in houses which were cut into a massive rock wall. Now the insides of many of the dwellings are exposed due to hundreds and hundreds of years of weathering and erosion. A winding narrow path takes you to the top of the village. It is worthwhile climbing up there to see the valley behind it and in the foreground a group of spectacular fairy chimneys. The abandoned village at Cavusin is a physical reminder of one of the travesties of Turkey Independence movement – the expulsion of Turkish Greeks as a result of the official “Population exchange between Greece and Turkey”, a sub order coming from the Treaty of Lausanne. The Exchange agreement took place in 1923 and saw the upheaval of over 2 million people based on their religious identities. 1.5 million Greeks from Anatolia were uprooted and sent to Greece, while around 500,000 Muslims were expelled from Greece and settled in locations across Turkey. The place makes for some interesting photography to say the least and is nestled amongst some of Cappadocia’s trademark landscape bearing a rich ochre colour. At the Cavusin old town, the church of St. John the Baptist rises on top of the hill. The church was built in the 5th century and it is the biggest cave church of Cappadocia even though it was divided into three rooms in 10th century against danger of collapsing. Most of the frescoes of St. John the Baptist church are faded by smoke but there are still some visible ones. St. John the Baptist offers a panoramic view of the village. The view from the top is stunning and it looked like caves in Petra. This place has taken away the charm to go to Petra of Jordan- I told Mohua ! 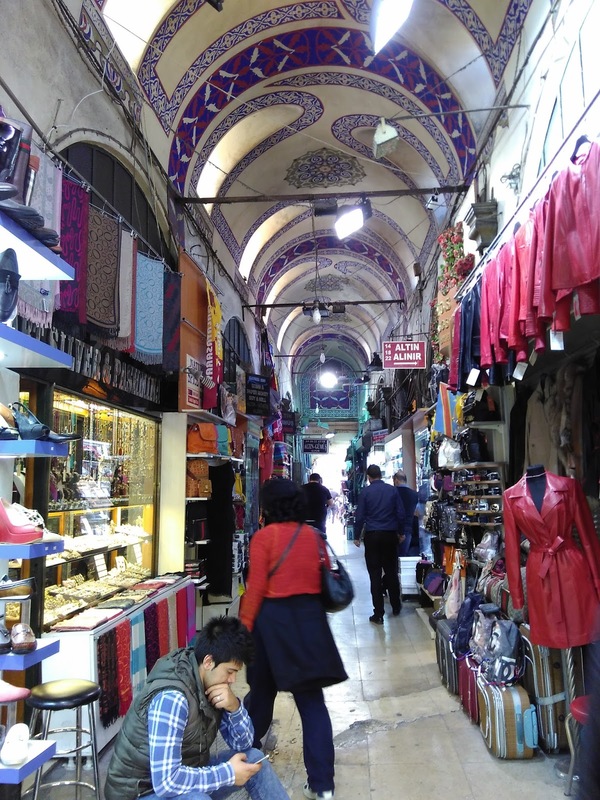 Here I bought my best souvenir at an amazing price of 30 TL. I thought it should have been at least 300 TL . I bought it like a flash ! 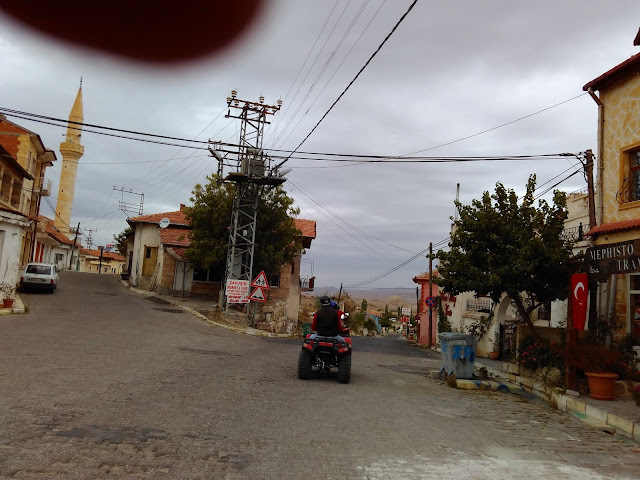 Then we went back to Goreme – Avanos road by the ATV. We went to see EL Nazar Church. It was closed - but the old security guard kindly allowed to see it - knowing that we are from India. On the way back to Gerome we saw many pottery shops selling wonderful ceramic plates , Nazar. We saw Nazar everywhere in Tureky. Every nation has superstitions of which some originated thousands of years ago. A popular belief existing in many corners of society is the evil eye. A look can cause pain, injury, or bad luck to anyone on the receiving end. People who are envious or simply believe that a person does not deserve the good fortune bestowed on them also give the evil eye subconsciously. 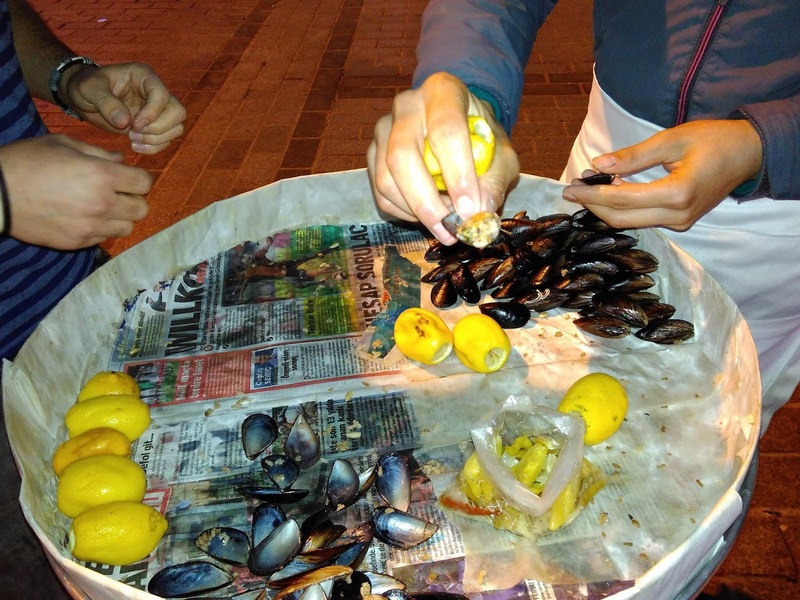 The Nazar Boncuğu is not just a Turkish tradition anymore. It is also the most popular souvenir sold. From small key rings to necklaces to large ceramic eyes to hang up in the home, they are all sold everywhere. Traditionally a circle or round sphere, it is dark blue with the shape of an eye in the middle. Stroll through the grand bazaar of Istanbul and you will lose count of the number of times you see it. 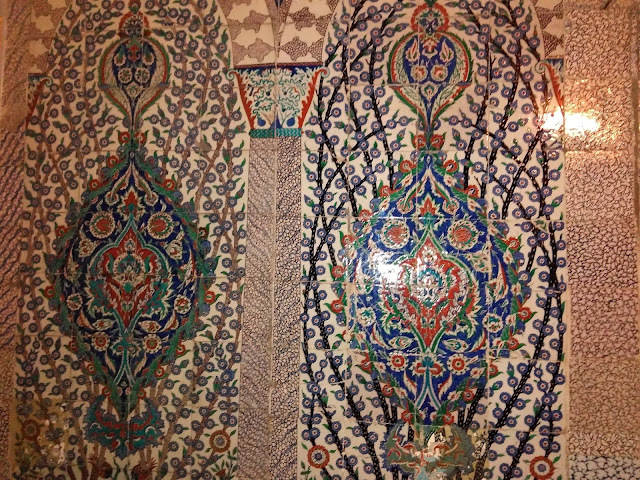 We later bought the ceramic from Istanbul ! It is actually cheaper here ! We reached Bus station after walking for 5 minutes. I could not make it to Avanos, because of lack of time. It is a town where you will visit a traditional pottery workshop. Set deep into the hillside, Avanos is the centre for terracotta works of art since 3000 BC. The clay, from the Red River passing through the town gives life both to the land and to the local economy. Then I decided to go Uchisar. All the famous hotels are located here. It is only 3 Km from Gerome. 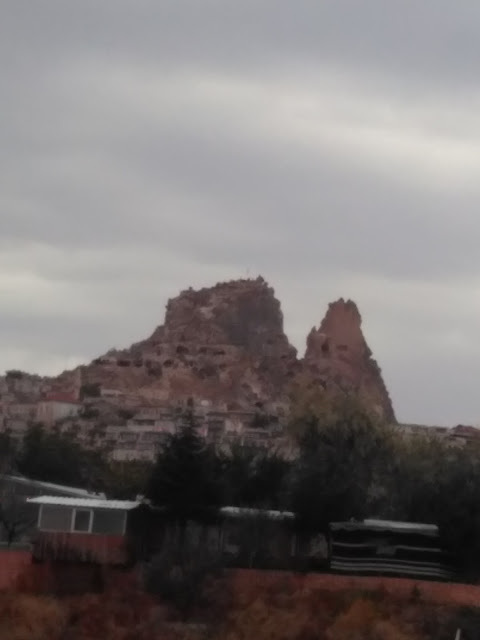 Uchisar is a troglodyte town situated right in the middle of Cappadoccia. It is named after the enormous piece of rock in the centre of the town, which was once used as a natural rock castle. 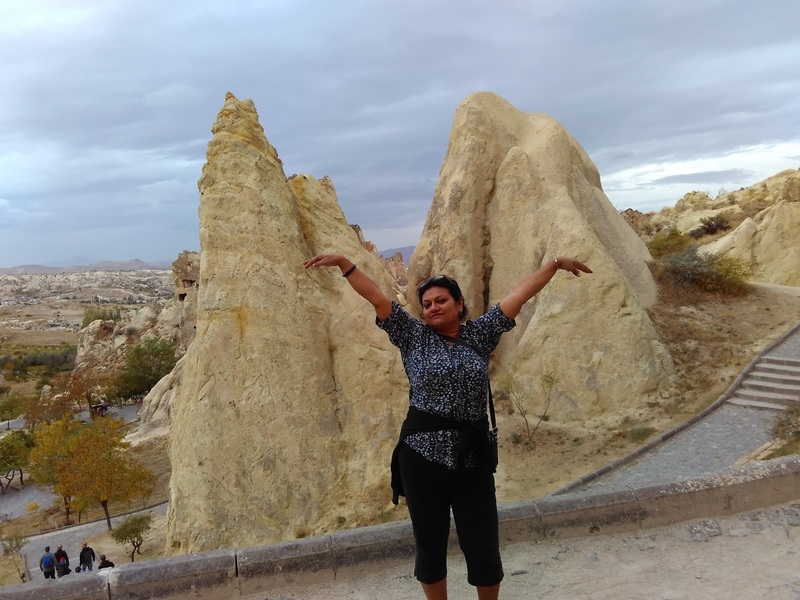 It is the highest point of the region .This extraordinary rock is the highest peak of the area with a view of whole of Cappadocia and Erciyes (Argeus) Mountain. I took a bus to go to Uchisar in spite of warning from Mohua not to go there , since we have a bus to catch. 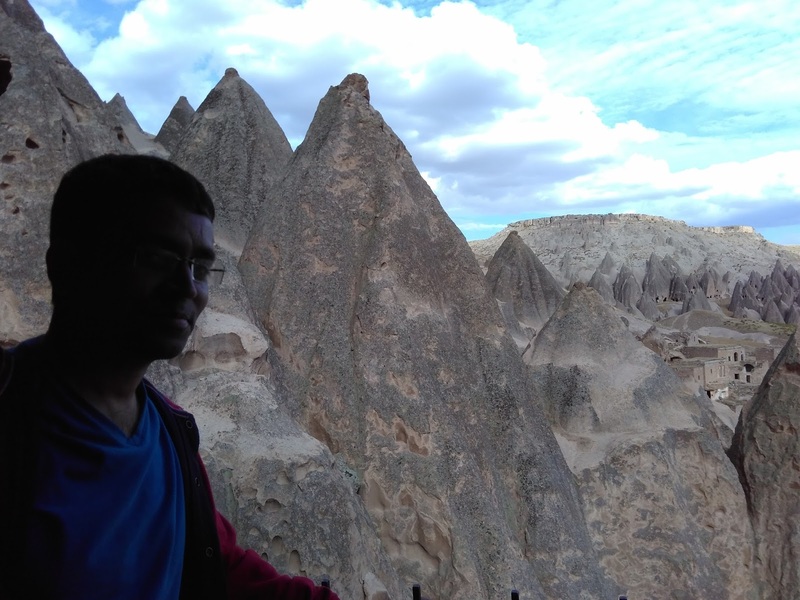 But I was adamant - since Uchisar is the image which I carried with me of Cappadocia - how I can go back without seeing it ! However I did see it while doing the green tour yesterday. 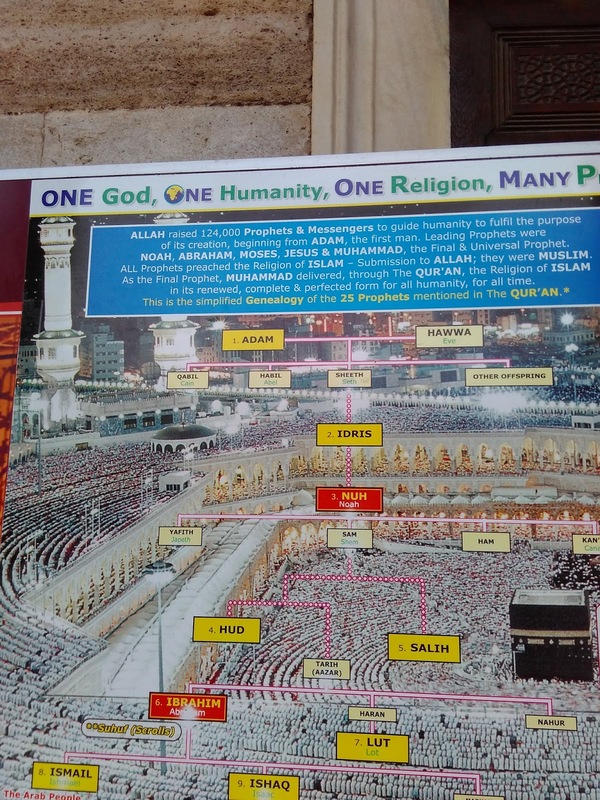 This is the place where all 5 star hotels are situated. There is hardly anybody on the road. I even met a person who is working in a hotel who is an Indian and said PA of a famous Bollywood star came here few days back. Anyways I took a wrong turn somewhere, even after asking many times - problem is there are not too many people to ask. We realized we cannot go to the top! I was beginning to get a little scared. For the 20 minutes I couldn't find anyone, I was quite scared since I could even miss the bus. Finally I managed to get on the right track and hitchhiked a dolmus to reach Gerome. He did not charge anything for that. The frequency of bus is poor at night. After reaching Gerome we went to have the famous Pottery Kebab in a restaurant near my hostel. In the meantime I went to the hotel to check out and bring my luggage to the restaurant. click here to see it ! 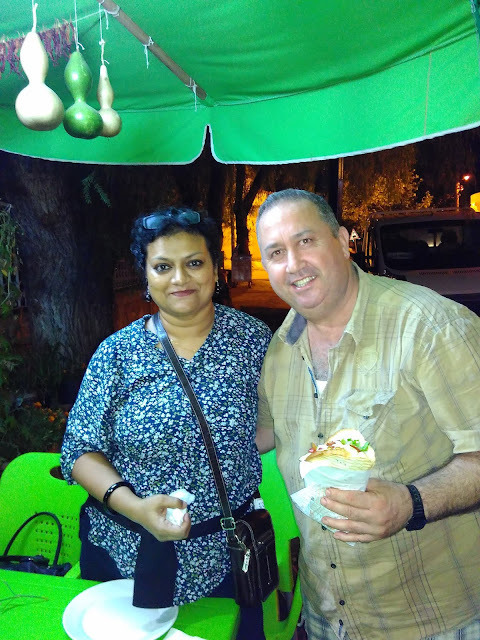 After having the delicious potter kabab we left for bus station very near to our restaurant. Our bus left within 10 minutes at around 8 pm. We reached Istanbul in the morning. From the Otogar we took a Dolmus to take us to a convenient location (free of cost by the bus co.) - since the Otogar is bit far from the centre of the Town. 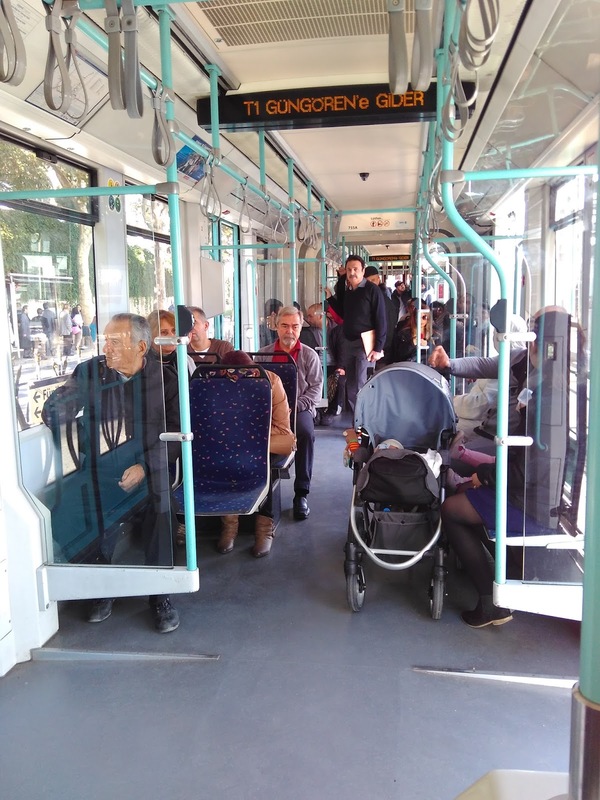 After getting down we took a Tram to reach Sultan-Ahmet area. One Turkish guy was extremely helpful to show us the way. It was raining - without his help it would have been difficult to reach our destination, without much hassle. I was so pleased with his behaviour that I gave him as small owl from Nutangram. On the North of Turkey is Black sea. On the South is Mediterranean. On the Western side is Aegean sea (beside Izmir). Aegean sea meets Mediterranean at the South West of Turkey. 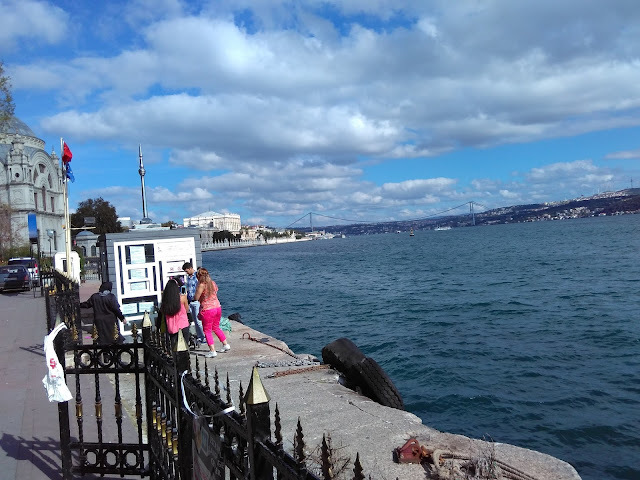 At the North West is Sea of Marmara. Marmara Sea is the inland sea, entirely within the borders of Turkey, that connects the Black Sea to the Aegean Sea. 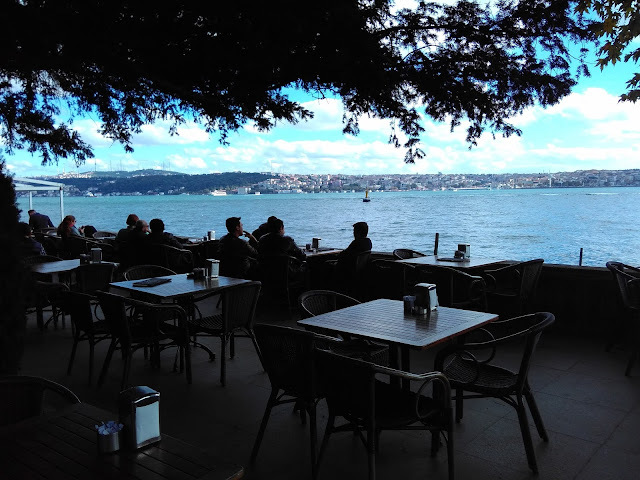 The Bosphorus strait connects Sea of Marmara to the Black Sea and the Dardanelles strait connects Marmara sea to the Aegean. Bosphorous separates Asian part with the European part. European part is only 3% of Turkey. But to me whole of Turkey is like Europe. The famous Golden horn (because of the shape) is at the confluence of Bosphorous with Marmara sea. 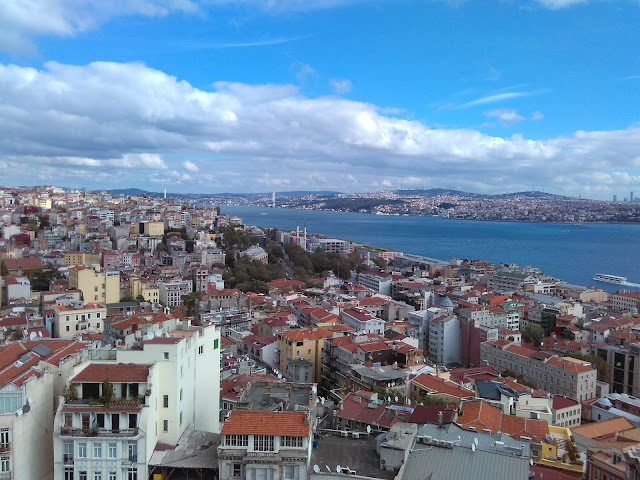 So from Sultan-Ahmet area or Galata tower what you see is either Bosphorous or Sea of Marmara. Analogically Howrah is Asian part, Kolkata is European part and Bay of Bengal is Sea of Marmara and Hooghly river is Bosphorous. Eastern side of Turkey is landlocked. It may be noted that Galata , Eminonu,Karakoy, Kabatas is on the European side while Uskudar, Kadikoy in on the Asian side. Normally when I was travelling in Bosphorous I was confused which one is Asian side and which one is the European side. To understand why Turkey is such an oasis among the Muslim countries you have to understand Mustafa Kemal Atatürk. He is the father of modern Turkey. He launched a programme of revolutionary social and political reform to modernise Turkey. These reforms included the emancipation of women, the abolition of all Islamic institutions and the introduction of Western legal codes, dress, calendar and alphabet ( replacing the Arabic script with a Latin one). Abroad he pursued a policy of neutrality, establishing friendly relations with Turkey's neighbours. Considered the George Washington of the Turks, Atatürk almost single-handedly created modern-day Turkey. 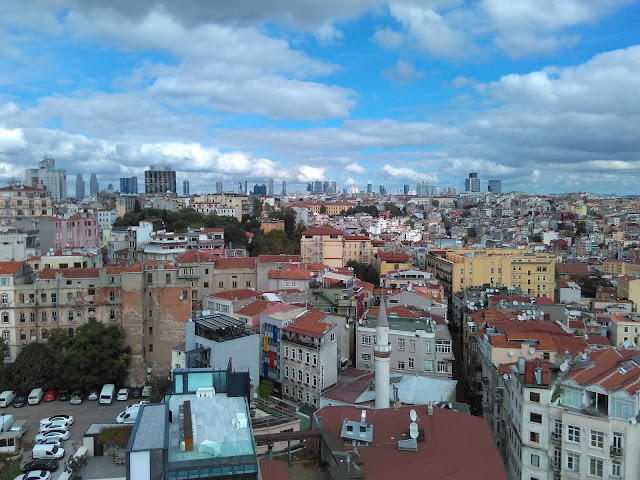 Our Hotel Cem Sultan is at an amazing location - it is very near (3 minutes walk) to Blue Mosque and and Aya or Haga Sofaya. Our hostel is around 5 minutes walk from the Tram stop. 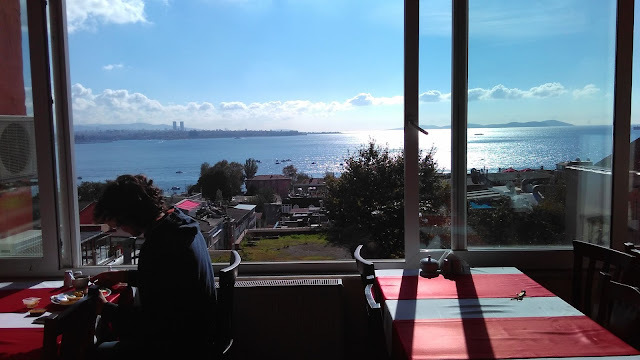 There is a wonderful view of the Bosphorous from the restaurant of our hostel. 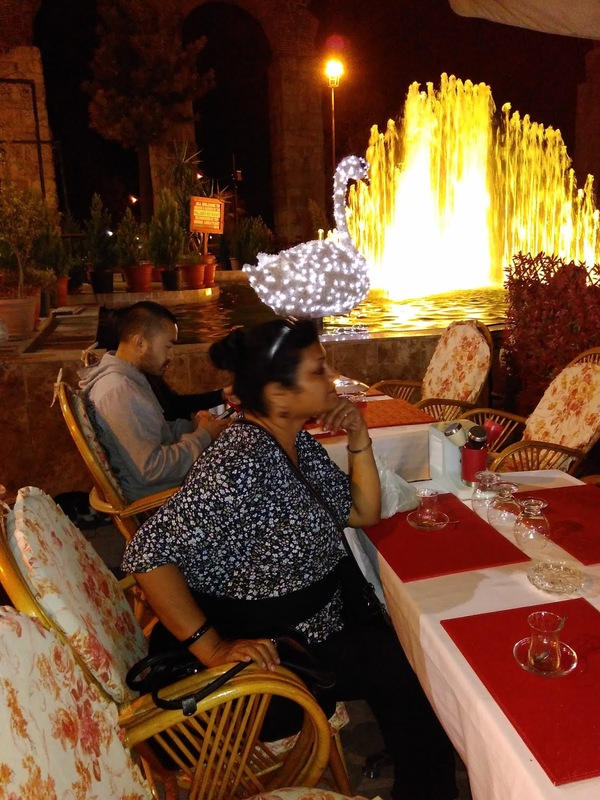 You can literally sit hours at the restaurant overlooking Bosphorous. 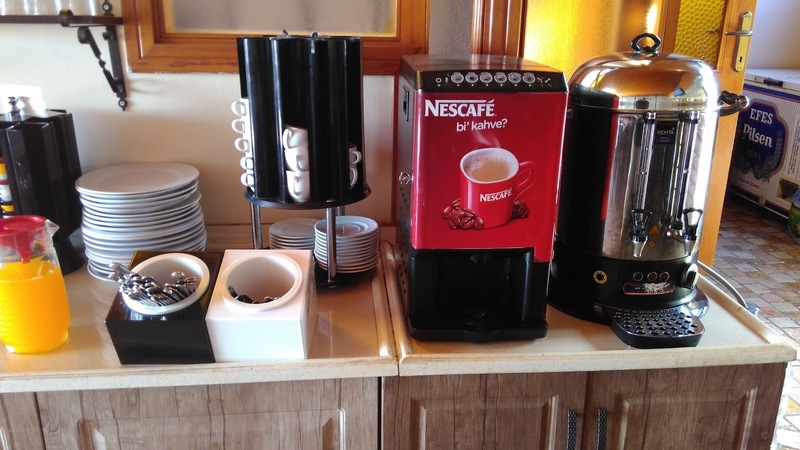 The owner of the hospital kindly allowed us to have breakfast on arrival - normally you are not supposed to have breakfast on the day, when you reach the hotel - but he kindly allowed us as to have breakfast. 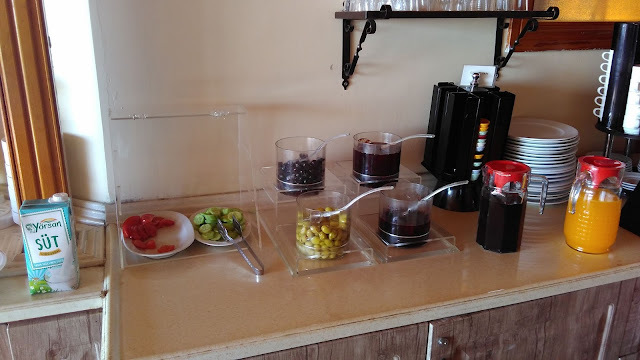 There is a wonderful spread for the breakfast. 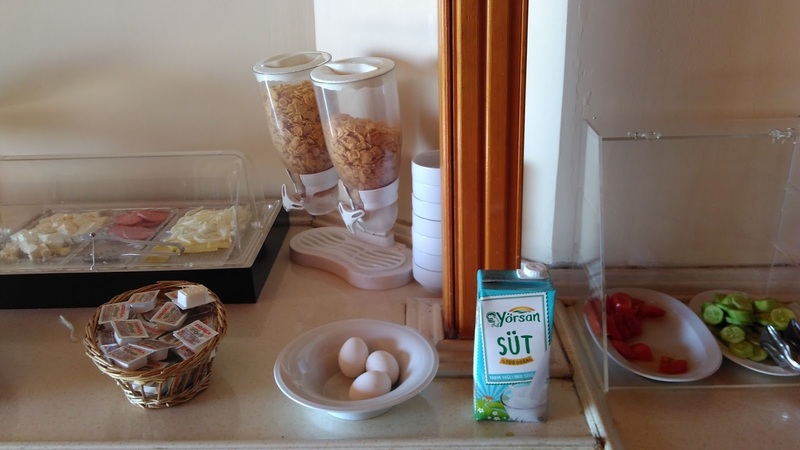 In fact I must admit this is the best spread we have found in Turkey. After having our breakfast we planned our day tour. 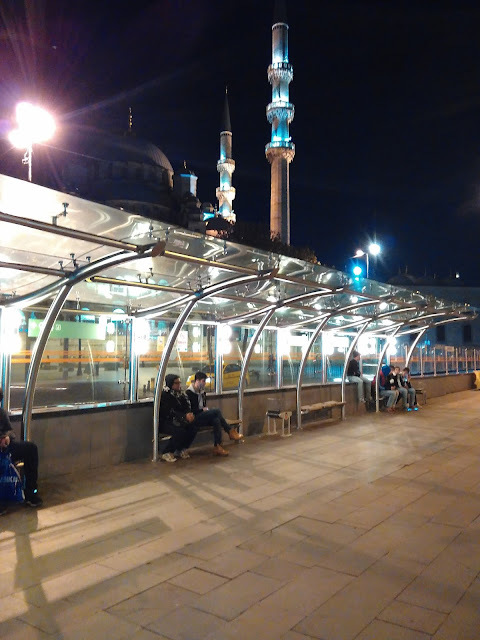 There is a hop on hop off bus waiting in front of Blue mosque/Aya Sofaya. So, as usual, Mohua was planning to take the Hop on hop off bus tour. 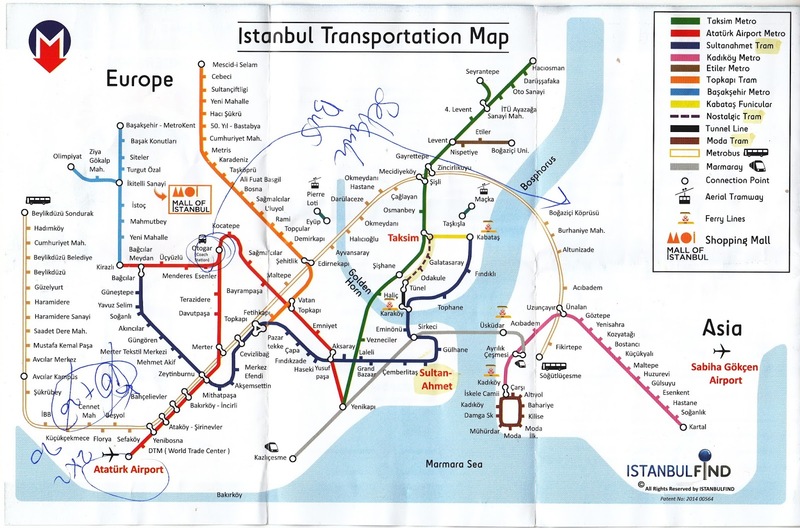 In fact our Hostel is located in Sultan Ahmet area – from where all the major places are 5 to 6 minutes walk .So I told Mohua there is no point taking the hop on hop off bus - since most the places we can walk on our own. We first decided to go to the blue mosque. 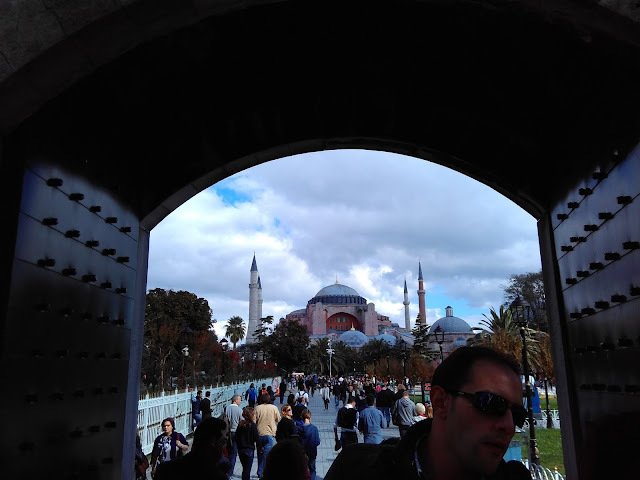 Since the prayers were going on in blue Mosque - we couldn't get inside - so we decided to go inside later. There is no entry fee for Blue mosque. We saw it from outside. İstanbul's most photogenic building was the grand project of Sultan Ahmet I (r 1603–17).It was built from 1609 to 1616 to reassert Ottoman power. The mosque's wonderfully curvaceous exterior features a cascade of domes and six slender minarets. Blue İznik tiles adorn the interior and give the building its unofficial but commonly used name. It is not blue from outside ! It was built with the intent of rivaling the Hagia Sophia (Ayas Sofya) - architects of the Blue Mosque pulled all stops trying to achieve the grandiosity of the Byzantine basilica, but were not quite successful . 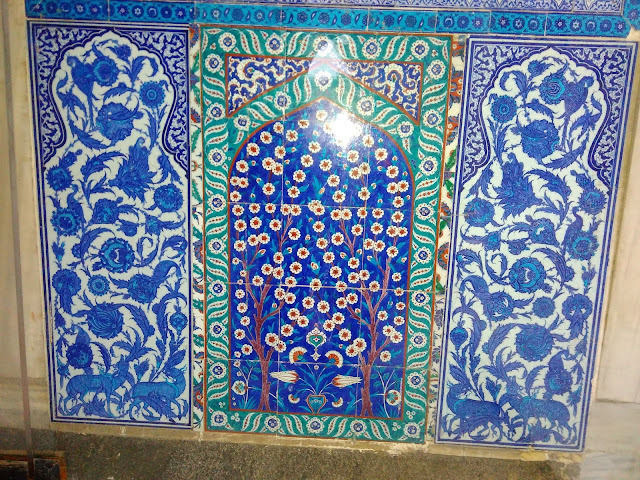 Inside the blue mosque there is a chart which starts from Adam and Eve and how Christianity and Islam evolved from the common ancestor. We met a nice Pakistani couple there. From there we decided go to Aya Sofaya. Actually the distance between blue Mosque and Aya Sofaya is hardly 150 metres. It was a church , but later converted into a Mosque - so there are both features of church and the mosque inside. It was once the world's largest cathedral (and remained so for nearly 1000 years), until Seville Cathedral was completed in 1520. It is one of the most impressive and important buildings ever constructed. Its wide, flat dome was a daring engineering feat in the 6th century, and architects still marvel at the building's many innovations. It is called Hagia Sophia in Greek, Ayasofya in Turkish, it was built in 537 AD on the site of Byzantium's acropolis by Byzantine Emperor Justinian (527-65 AD). 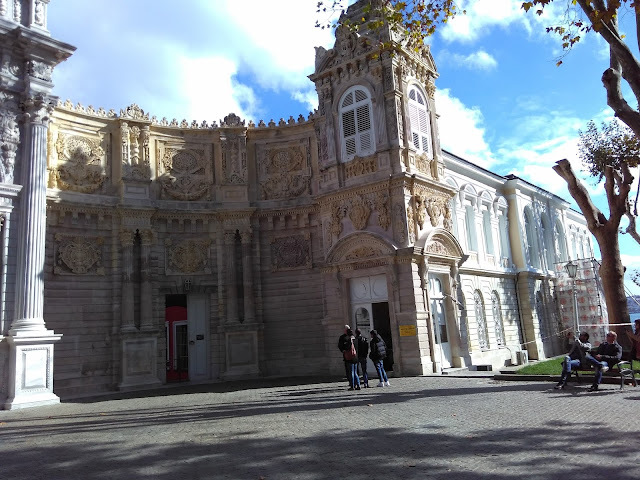 It was originally a Greek Orthodox Christian patriarchal basilica (church). In 1453, Sultan Mehmed II conquered the capital city of Constantinople and ordered the church to be converted into a mosque. 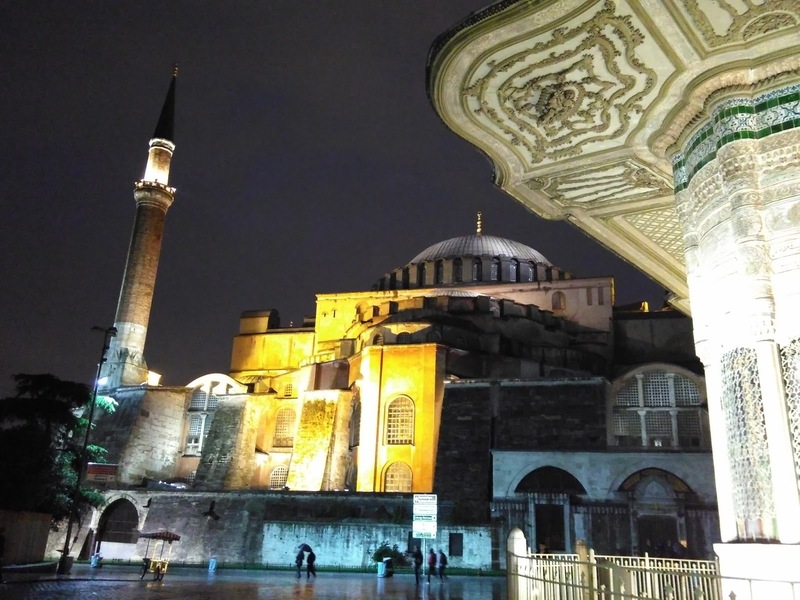 Hagia Sophia is now a museum. 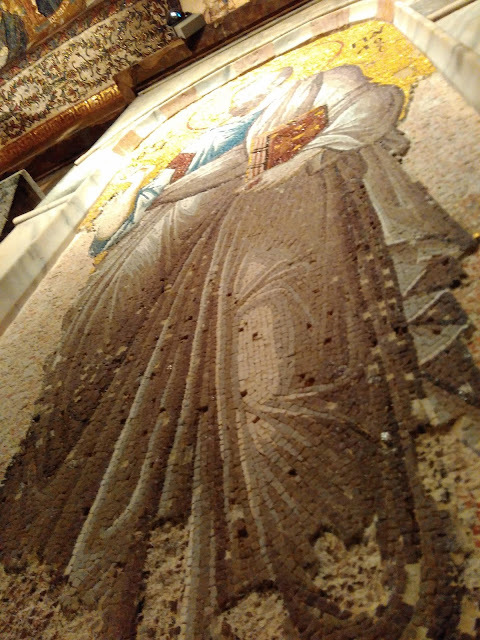 The bells, altar, iconostasis and sacrificial vessels and other relics were removed and the mosaics depicting Jesus, his Mother Mary, Christian saints and angels were also removed or plastered over. Islamic features—such as the mihrab,minbar, and four minarets— were added. Considering that entry to Topkapı Palace costs TL40, and to Hagia Sophia another TL40, and that the other museums have entry fees of TL20 or more, if you visit the top museums and one more, you've paid for the pass. From there we went to the Basilica cistern. It is only 4 minutes from Aya Sofaya/Blue mosque. Many tour companies do not cover blue Mosque and Aya Sofaya on the same day for some unknown reason. When we went to Basilica cistern it was raining slightly. The Basilica Cistern is the largest of several hundred ancient cisterns that lie beneath the city of Istanbul (formerly Constantinople), Turkey. The cistern was built in the 6th century during the reign of Byzantine Emperor Justinian I. 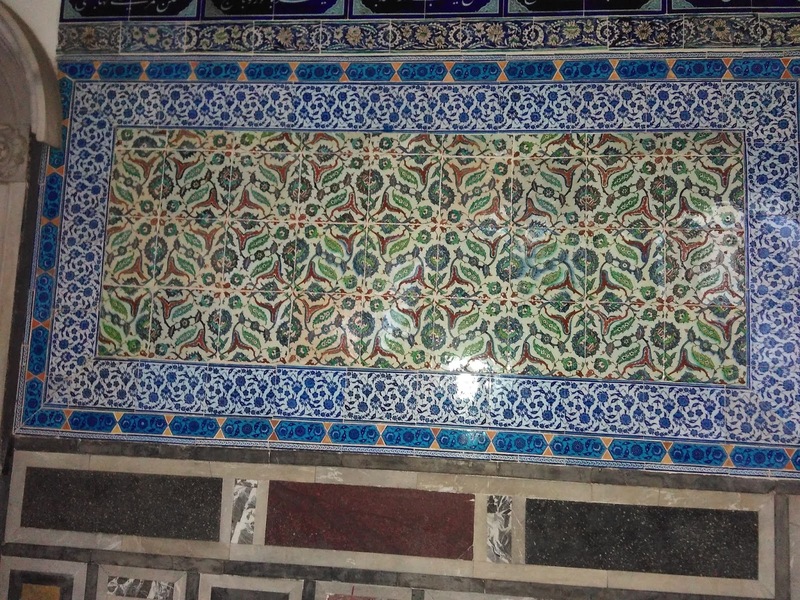 The enlarged cistern provided a water filtration system for the Great Palace of Constantinople and other buildings on the First Hill, and continued to provide water to the Topkapi Palace after the Ottoman conquest in 1453 and into modern times. This cathedral-size cistern is an underground chamber approximately 453 ft by 212 ft – capable of holding 2,800,000 cu ft of water. The capitals of the columns are mainly Ionic and Corinthian styles with the exception of a few Doric style .The Basilica Cistern's water came from 19 kilometres north of the city. Located in the northwest corner of the cistern, the bases of two columns reuse blocks carved with the head of Medusa. After cistern we decided to go to Topkapi palace - all within walking distance - located around Sultanahmet Square. 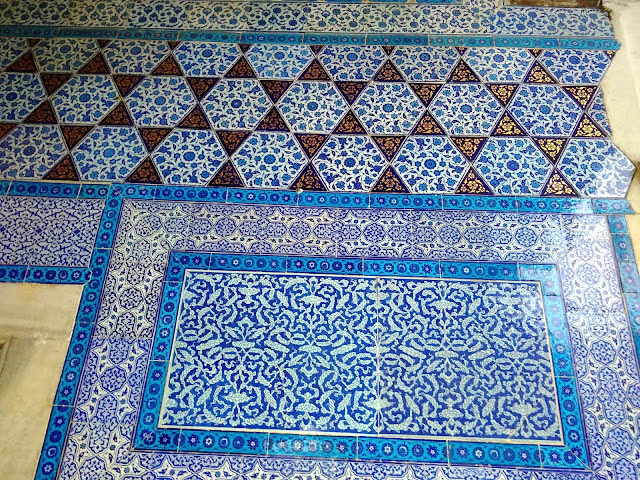 The Turquoise tiles inside the Topkapi palace reminds me of the tiles you normally get to see in Iran. It was built in between 1466 and 1478 by the Sultan Mehmet II dominating the Golden Horn to the north, the Sea of Marmara to the south, and the Bosphorus strait to the north east, with great views of the Asian side as well. The palace was the political center of the Ottoman Empire between the 15th and 19th centuries, until they built Dolmabahce Palace by the waterside. After the Conquest of Constantinople in 1453, Mehmet II ordered to built his palace in its present location on top of the ancient Byzantine ruins, meanwhile he spent some time during its construction at a smaller palace where there is the University of Istanbul today, in Bayezit square. Once they moved to Topkapi palace, the old one was called as "Old Palace" and Topkapi as the "New Palace". But local people called it as "Topkapi" which in Turkish means "Gate of Cannons" because of huge cannons displayed outside of its gates. 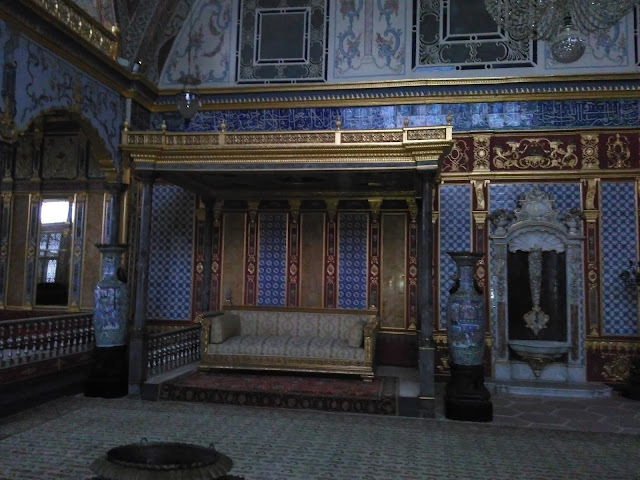 During the 400 hundred years of reign at Topkapi, each sultan added a different section or hall to the palace, depending on his taste or on the needs of the time. Therefore the palace is formed by a maze of buildings centered around a series of courtyards protected by different gates. 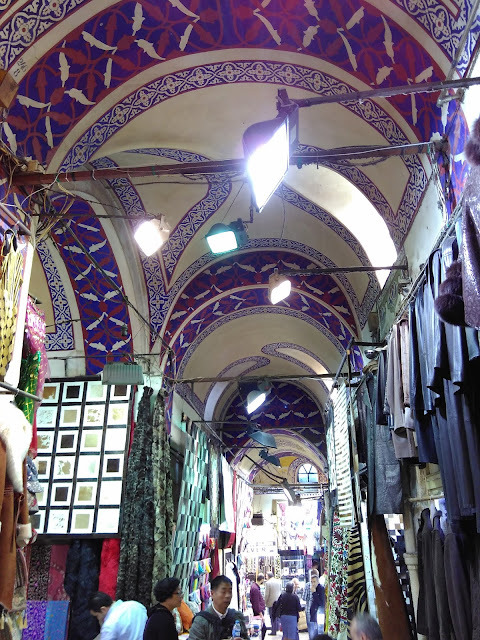 Its architecture is predominantly Middle Eastern in character. Topkapi is the subject of more colourful stories . Libidinous sultans, beautiful concubines and scheming eunuchs lived and worked here between the 15th and 19th centuries . Visiting the palace's opulent pavilions, jewel-filled Treasury and sprawling Harem gives a fascinating glimpse into their lives. Yes this is the most famous harem of Istnabul. The palace compound is a rough rectangle, divided into four main courtyards and the harem. 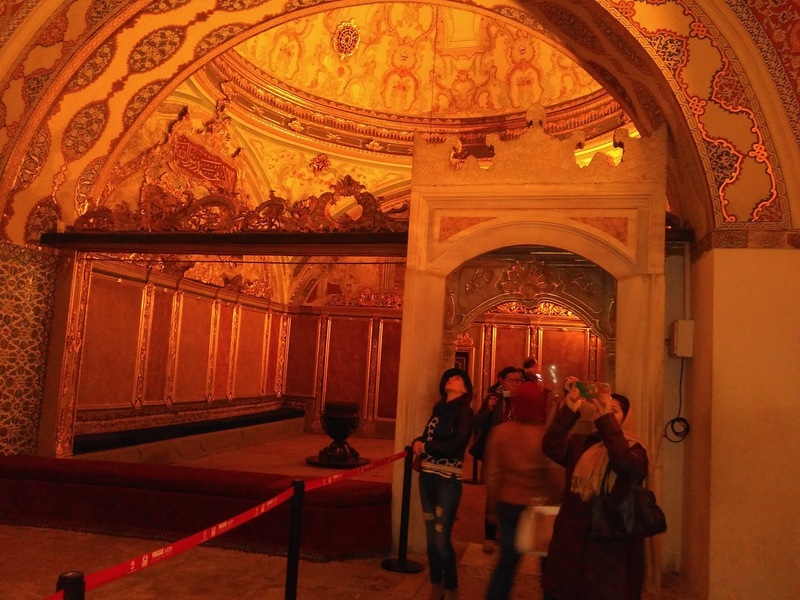 In fact Harem is one of the most beautiful part of Topkapi Palace and there is a separate entry fee for that ! As popular belief would have it, the Harem was a place where the sultan could engage in debauchery at will. Probably these were the imperial family quarters and every detail of Harem life was governed by tradition, obligation and ceremony. The sultans supported as many as 300 concubines in the Harem. 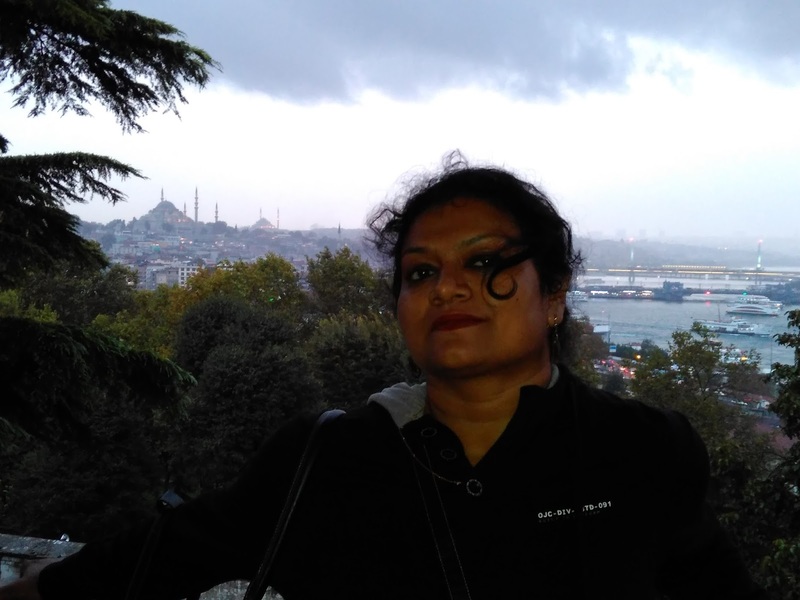 There is wonderful view of the City from Topkapi palace. 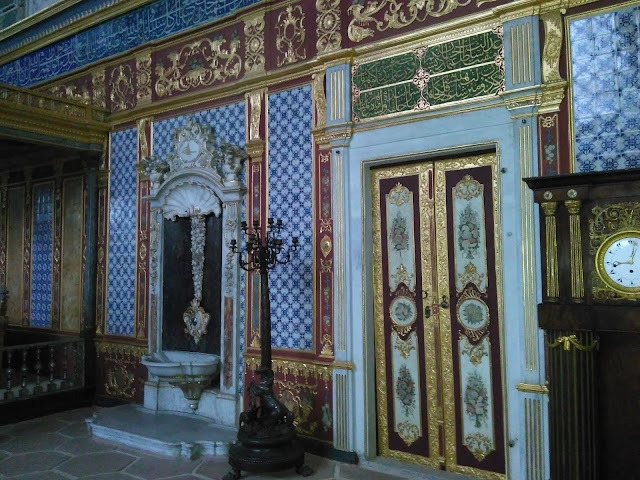 I somehow managed to see the topkapi palace - in fact another 10 minutes would have done justice to the whole Palace - but it was getting dark and we were forced to cut short the tour. After having our dinner at Sultanahmet area we decided to go back to hostel. 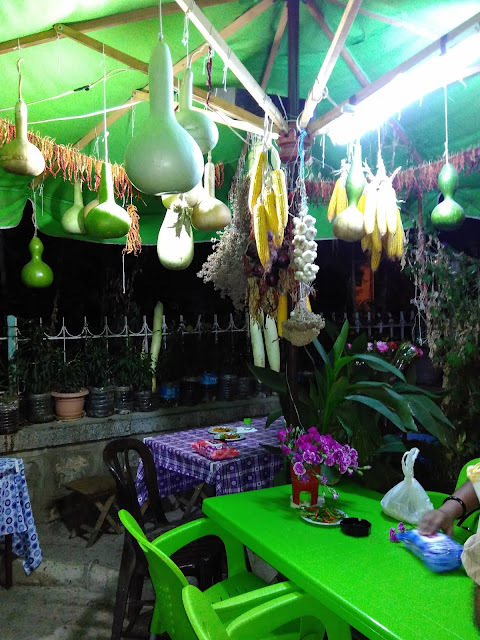 While coming back to our hostel we saw the famous Mesala Cafe . It is probably 1.5 minutes from our hostel. We saw dearvish dance going on and people were having Hookah. Having Hookah is a way of life - unlike what we see in some night clubs in Kolkata - where it is a style statement. There were different food stalls around - so you can have dinner, have hookah and see the dearvish dance. People all over the globe were sitting and enjoying the dance. 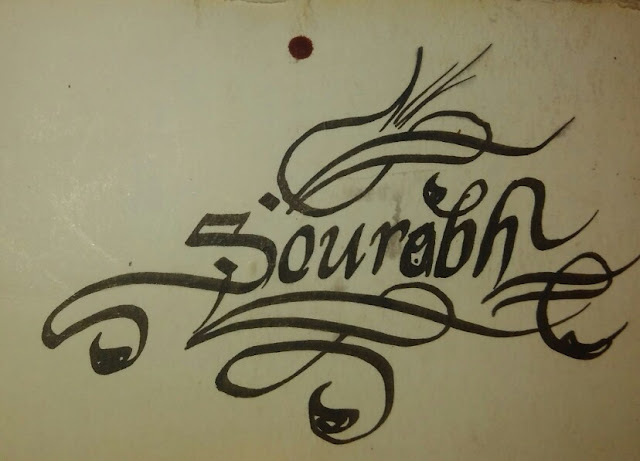 After spending some time we left for our hostel.There is a calligrapher sitting in front of Masala Cafe who wrote my name in a sheet of paper. He charges 5TL. 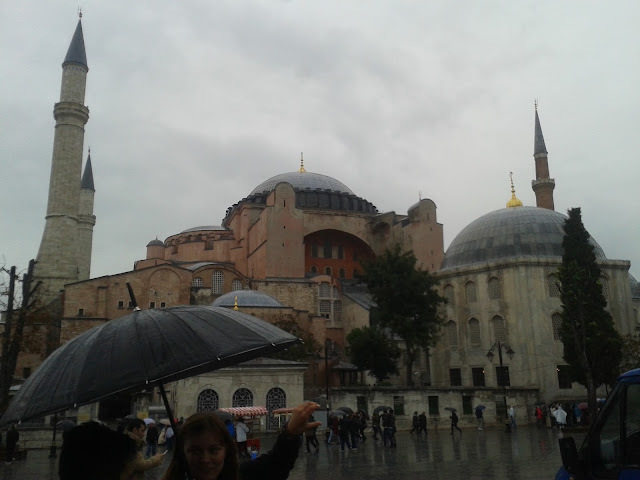 While going to Chora chuch we saw Fatih mosque. Though nobody talks about this - but it is quite stunning from outside ! 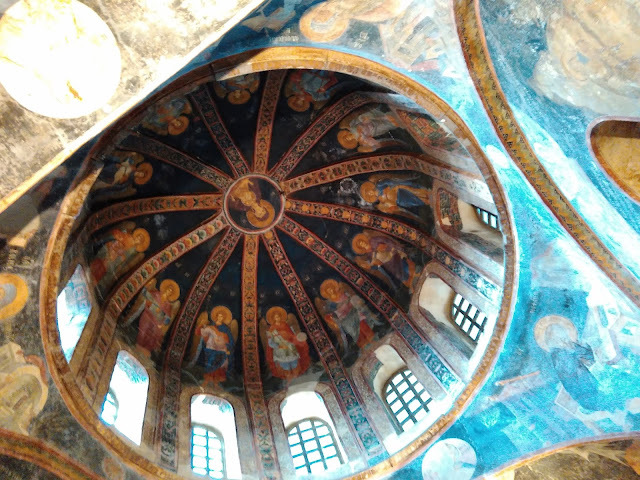 Anyway after lot of walking we finally reached Chora Church. We had to take the help of a shoe shine boy. The church is quite unique . 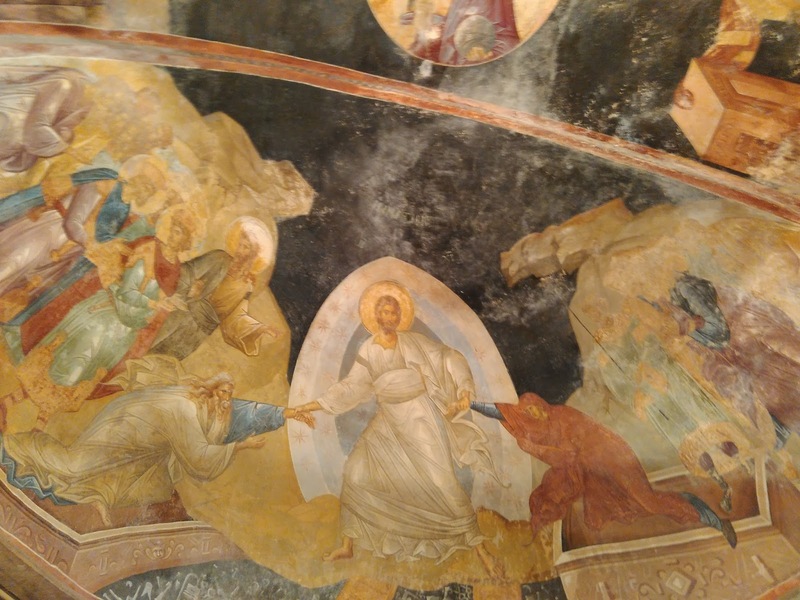 I haven't seen such type of Fresco in Turkey yet - in any other church or mosque in Istanbul or for that matter in Turkey. The Chora Museum, Mosque, or Church is an extremely ancient Byzantine Greek Orthodox church preserved as a museum in the Edirnekapi neighborhood of Istanbul. 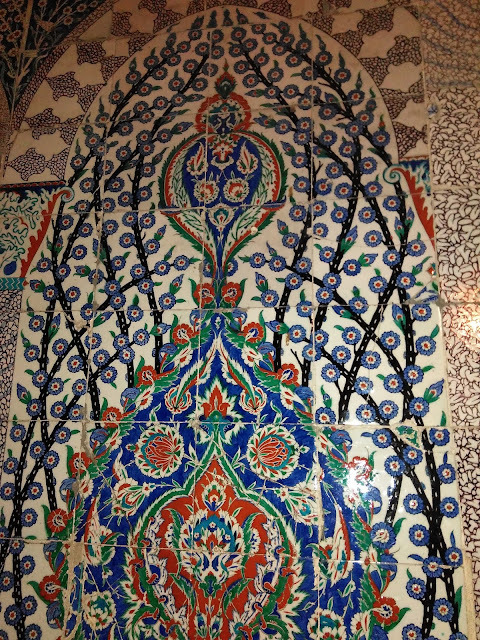 In the 16th century, during the Ottomanera, the church was converted into a mosque; it became a museum in 1948. 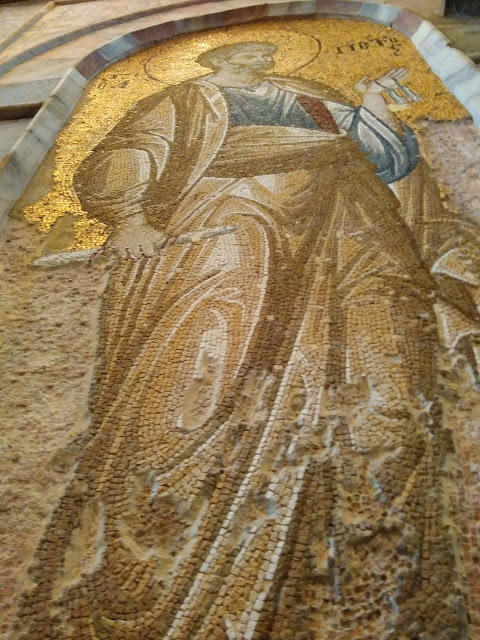 The interior of the building is covered with some of the oldest and finest surviving Byzantine mosaics and frescoes; they were uncovered and restored after the building was secularized and turned into a museum. The original church on this site was built in the early 5th century and stood outside of the 4th century walls of Constantine the Great. It is often said that walking 1 kilometre is more interesting than traveling hundred kilometres by car . After walking for some time we saw a football stadium. It is a third division team and the name is Karagumruk spor lokali (https://www.facebook.com/karagumrukps3 ) . The game was about to start. 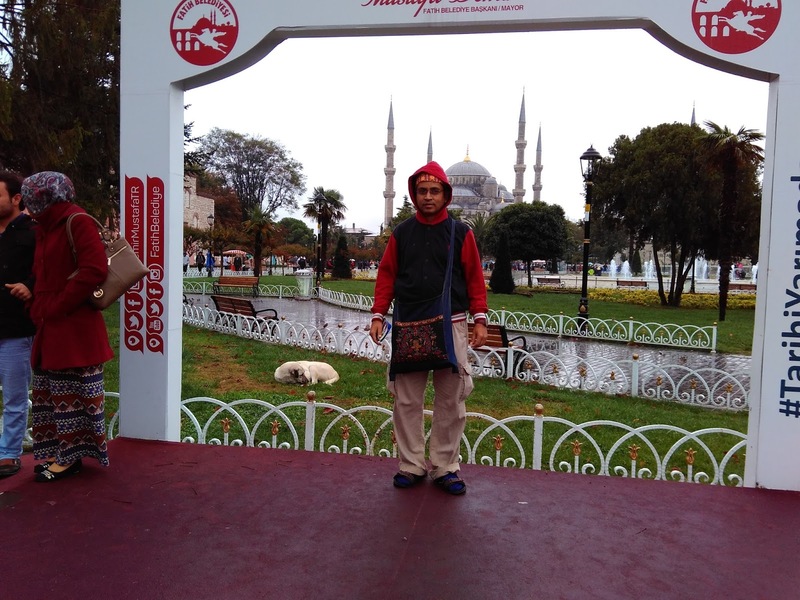 We saw the practice for some time and left for Sulemaniye mosque. On the way to Sulemaniye mosque we had our lunch of “Durum” - which is nothing but our very own Chicken Roll - but nicely packaged. Almost in every cigarette shop we saw Doner Kabab - similar to the one we see in Lebaneses shop in Kolkata - where a grill moves in a circular way. On the way a bride coming out of special bridal shop - Muslim wedding in Christian way ! On the way we accidentally bumped into sehzade mosque. Sehzade Mosque is simply stunning, I was surprised that nobody talks about shehzade Mosque. 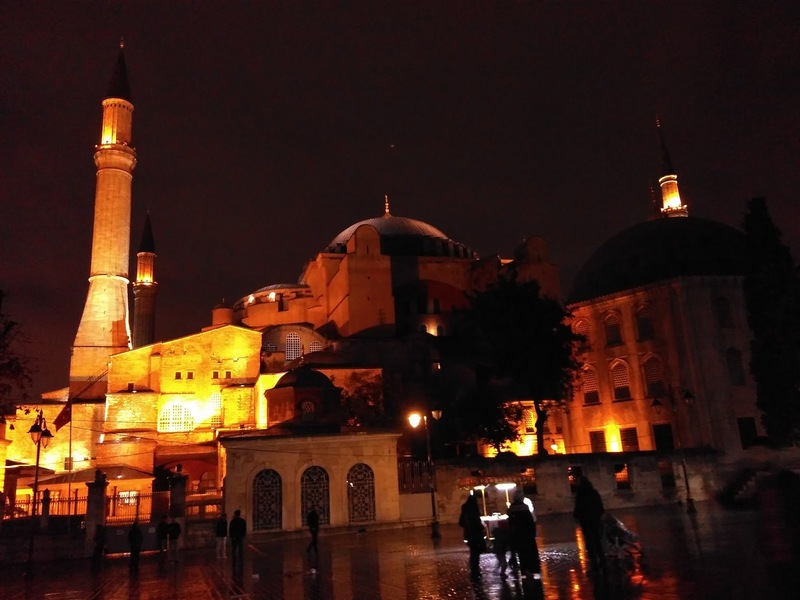 If Sehzade mosque was in any country, other than Turkey, then if it would have been the talk of the town. But unfortunately this is Turkey and everything is so beautiful, so even a Mosque like Sehzade hardly gets any reference. 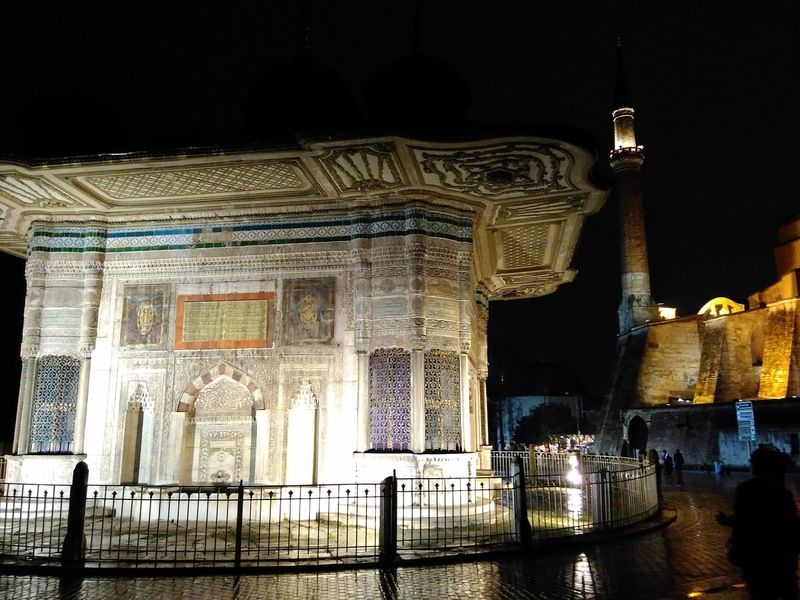 The Şehzade Mosque (Turkish: Şehzade Camii') is a 16th-century Ottoman mosque located in the district of Fatih, It was commissioned by Suleiman the Magnificent, as a memorial to his son Şehzade Mehmed who died in 1543. It is sometimes referred to as the "Prince's Mosque" in English. If we did not walk we surely would have missed it. 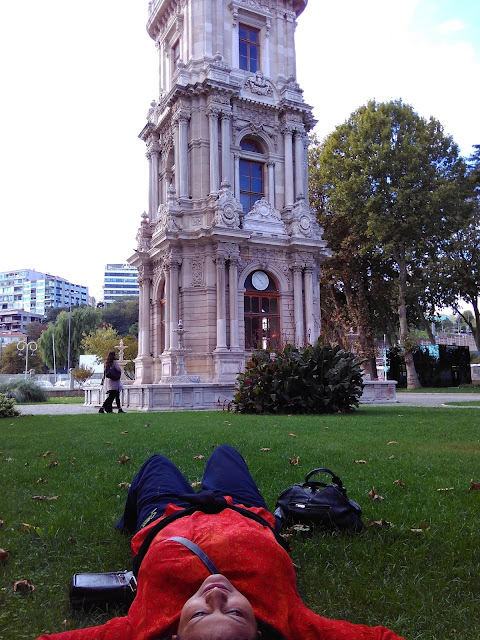 After walking for quite some time we finally reached Süleymaniye Mosque . I underestimated the distance from the map ! Mohua was as usual upset with me ! Sulemania Mosque is one of the most famous mosques in Turkey. It was on my bucket list . 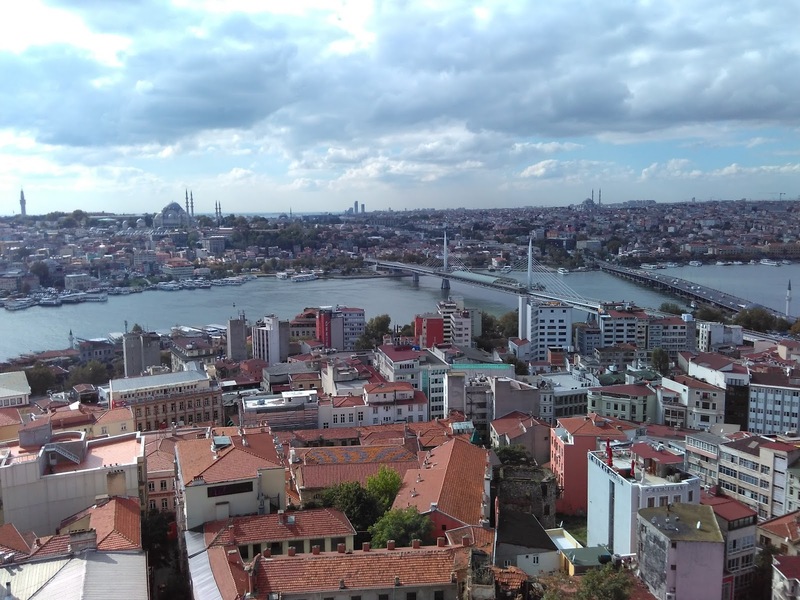 The best thing about Süleymaniye Mosque is you get a wonderful view of the whole city from the mosque. You can have a panoramic view of the whole city . 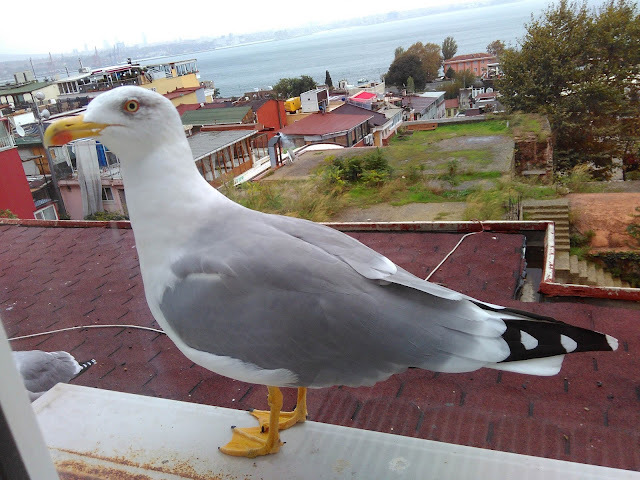 It is very near to bosphorus. The Süleymaniye Mosque is an Ottoman mosque. The Süleymaniye Mosque, built on the order of Sultan Süleyman was finished in 1558. 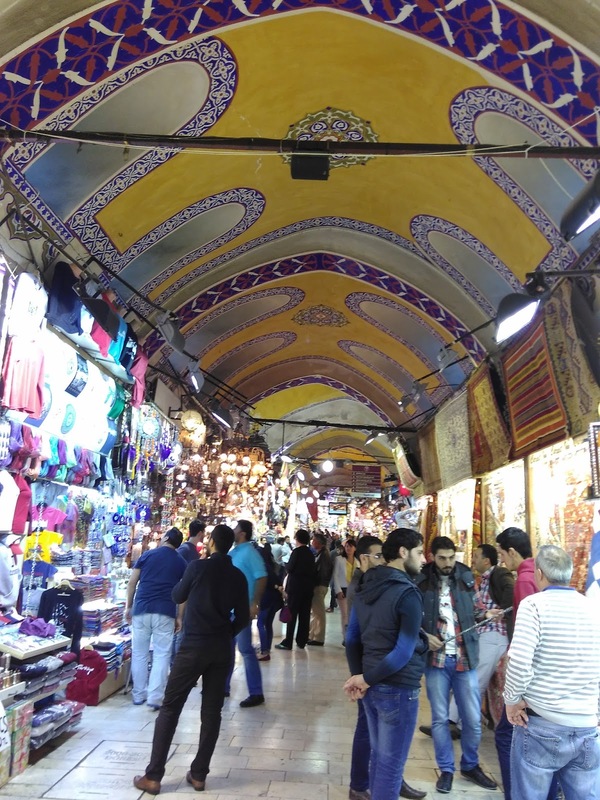 After spending some time at Süleymaniye Mosque - we started walking towards Eminonu pier - before going to the pier - you have to walk through the famous Egyptian market/ Bazar . In the Egyptian market interestingly I met a Bangladeshi. I got to know many things from him. He first came as a student in Armenia. But when most of his friends from Bangladesh left Armenia, since economy of Armenia is not doing well - he ran away to cross the border of Turkey. Once you are in Turkey, they put you in jail for few days for illegal border crossing - then you are set free . He is now working in one of the shops selling the spices in Egyptian Bazar. Egyptian Bazar is just beside the Eminonu pier from where the bosphorus cruise takes place. Just beside the Egyptian bazar / Eminonu pier is a new Mosque or Yeni Cami (pronounced Yeni jami) ; originally named the Valide Sultan Mosque (Turkish: Valide Sultan Camii) and later New Valide Sultan Mosque after its partial reconstruction and completion between 1660 and 1665; is an Ottoman imperial mosque located in the Eminönü quarter of Istanbul. If you see the map – then you will understand , even after crossing the bridge (there is also tram line here on the bridge) it is still the European side. 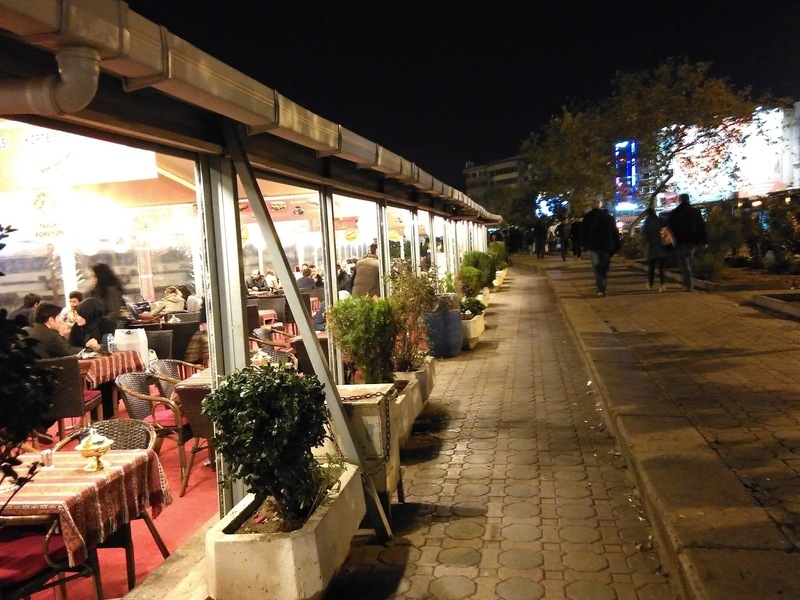 Eminonu pier is the heart of the walled city of Constantinople and it seems to be the most important pier. In Istanbul, Large ferry Boats/ liners take only a certain route from any given quay and these quays are signposted ‘Uskudar Iskelesi’ . 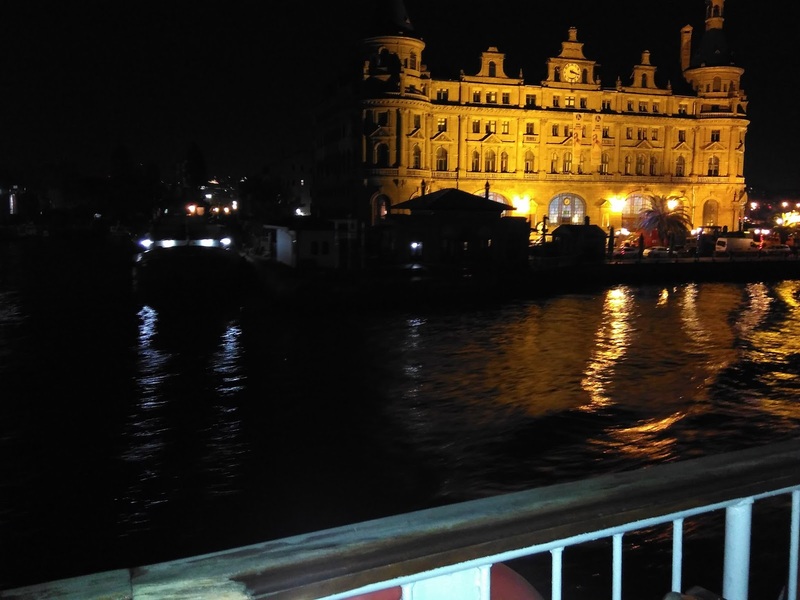 In Eminönü there are more than 5 landing stages, so if you want to go to Üsküdar, you should take the ferry which departs from ‘Üsküdar Iskelesi’. The second option of travelling like a local people - but the ship is quite luxurious (though "local" ) and the view from the ship is absolutely stunning . I saw one of best sunsets sitting in the boat . We paid only 2.5 Turkish Lira for each trip. We did number of trips randomly. We went from that one place to another. In one of those piers, I saw some people singing Turkish song. We sat beside the pier along with the Crowd and enjoyed the music . Since it was getting late and the last vessel will leave shortly , so we had to come back to Eminonu and completed our amazing Bosphorus Cruise like a local. I must say this is much cheaper and better version than travelling like a tourist. We also had some famous Tukish tea for 0.5 TK inside the vessel ! There are also food and drinks inside that vessel/ship. 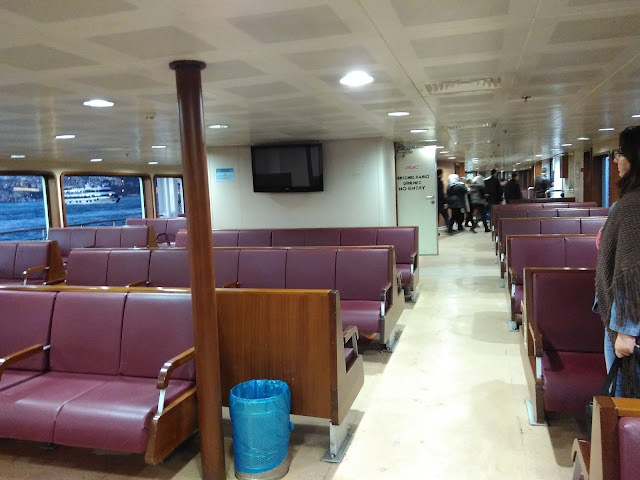 It is really quite luxurious - not like the local ferries we see in India. 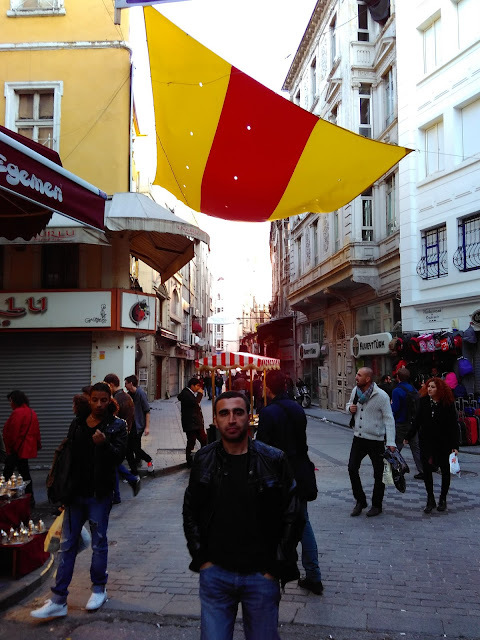 The best possible tour is possibly Karakoy/Eminonu to Kadikoy/Uskudas - which is the longest. While coming back, I saw that a match between Galatasaray and Fenerbahçe has just taken place - it is like Mohun Bagan vs East Bengal. After the match people were shouting like anything and surprisingly they are also lighting a fire the way East Bengal club supporter do when they win, as part of the celebration. So we took some pictures with two friends who are supporters of 2 different clubs. Later I learnt that the score was 1-1. The most important thing is jersey of Galatasaray is just like East Bengal. While we were coming back we saw people fishing along the bosphorus bridge . 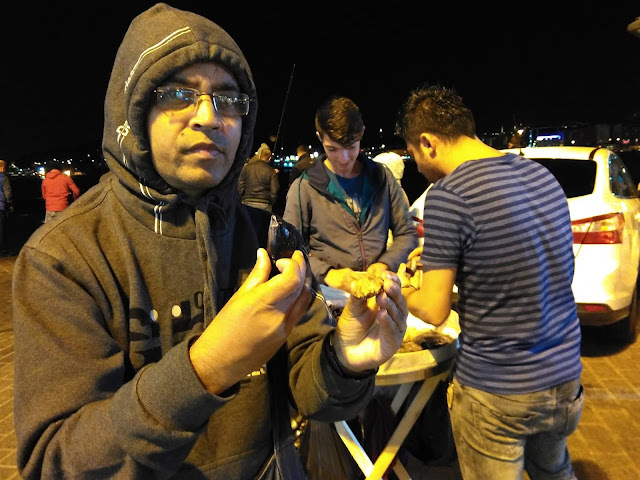 In fact bosphorus Bridge is famous for the endless anglers If you walk on the bosphorus bridge, you will find numerous people sitting with their instrument and trying to catch fish - in fact it smells bit fishy . We had some Oyesters on the way back. Even Mohua had one ! We returned to Hotel after having some dinner in one of the restaurants near our hotel. On the way to the hotel we saw many Syrian refugees sitting on the footpath. There are sweets all over Turkey and Istanbul . the Turkish people love sweet as much as the Bengalis. 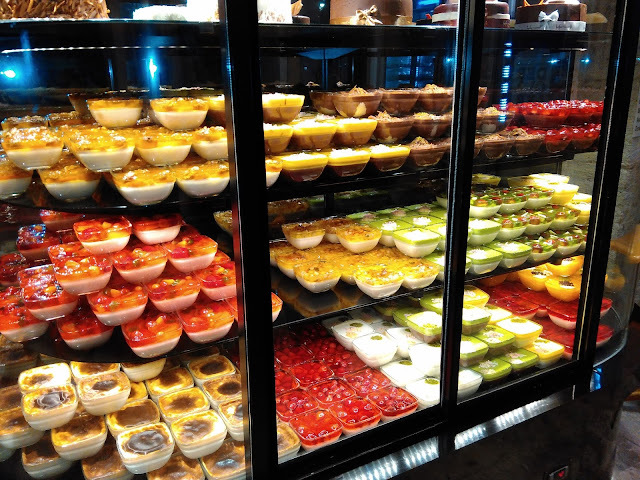 I found it very interesting - there are so many sweet shops and so much variety of sweets - I lost count. Today is our last day in Turkey. 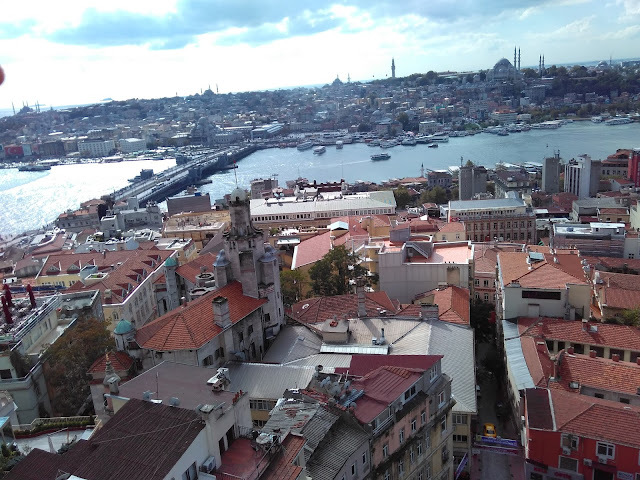 We decided to go to Galata tower which is just across Eminonu Pier - very near to Karakoy. 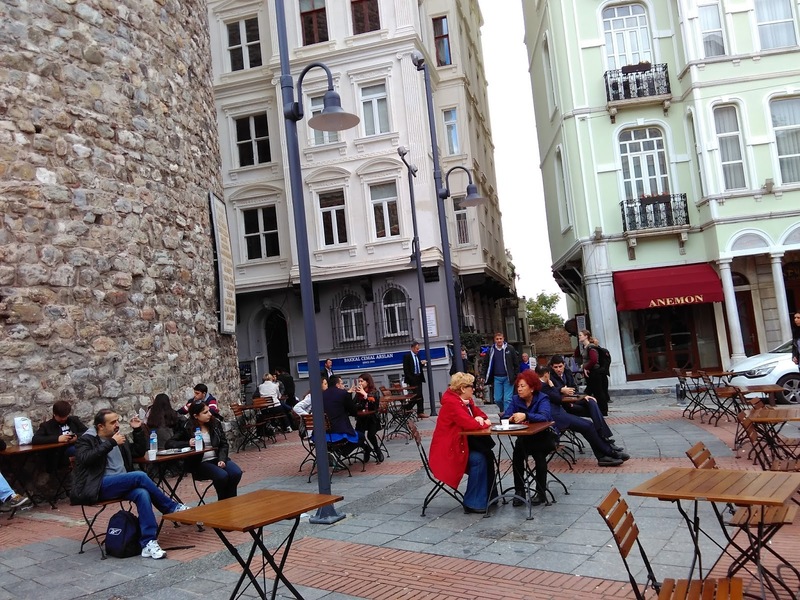 We went there by tram and got down near Galata Tower. 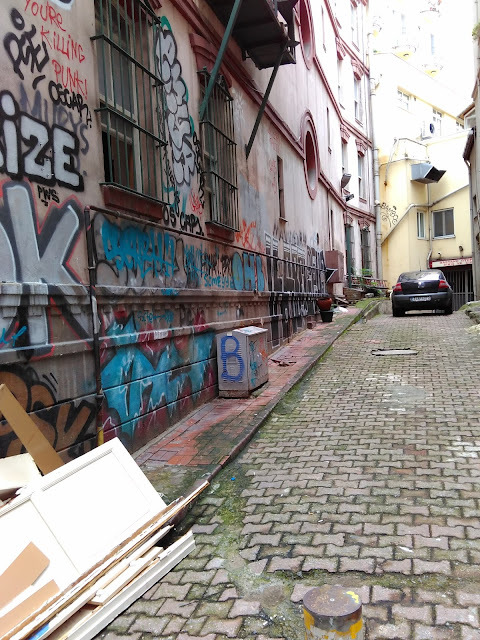 Galata, and Beyoğlu, further north, with its main thoroughfare, the pedestrianized Istiklal Street and the adjoining Taksim Square is the district of Istanbul, north of Sultanahmet/Old City. Taksim Square is usually considered the “city center” of Istanbul. Primarily visited for its nightlife, this district has also its own share of sights and accommodation. The Galata Tower is a medieval stone tower in the Galata/Karaköy quarter of Istanbul. It is one of the city's most striking landmarks and offers a panoramic view of Istanbul. The tower was built in 1348 . 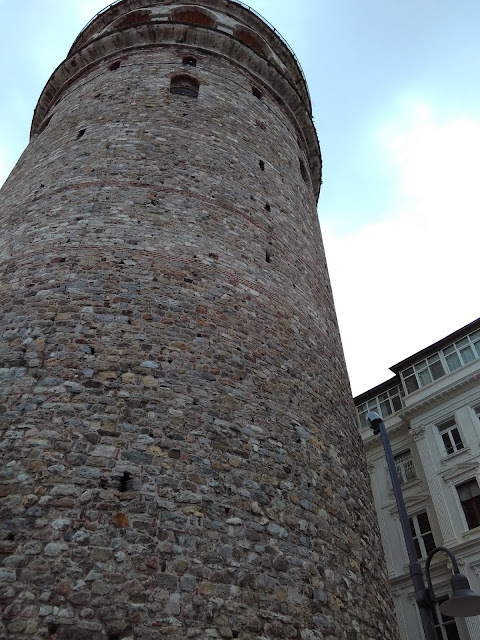 Galata Tower was the tallest building in Istanbul at 219½ feet when it was built in 1348. 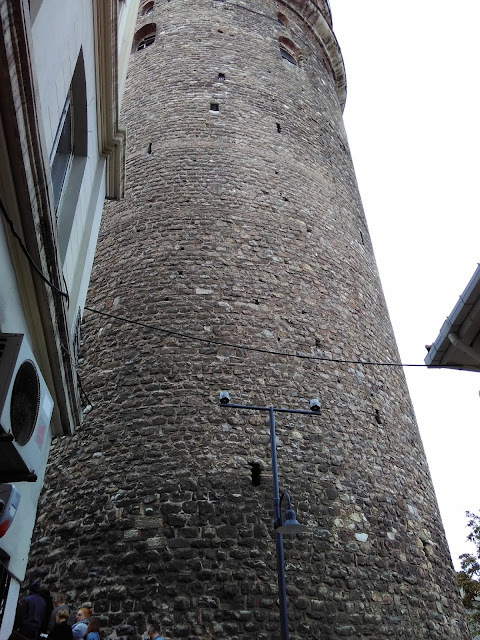 It was built to replace the old Tower of Galata, an original Byzantine tower named Megalos Pyrgos (English: Great Tower). That tower was on a different site and was largely destroyed in 1203, during the Fourth Crusade of 1202–1204. You have to climb up from the tram stop to reach the base of Galata Tower. There you have to wait patiently and stand in a queue for your turn to go to the top - there is a lift which takes you to the top - which has a 360 degree view of the whole city ; the view is really stunning . After spending some time there we decided to go down . There is a restaurant at the top too ! 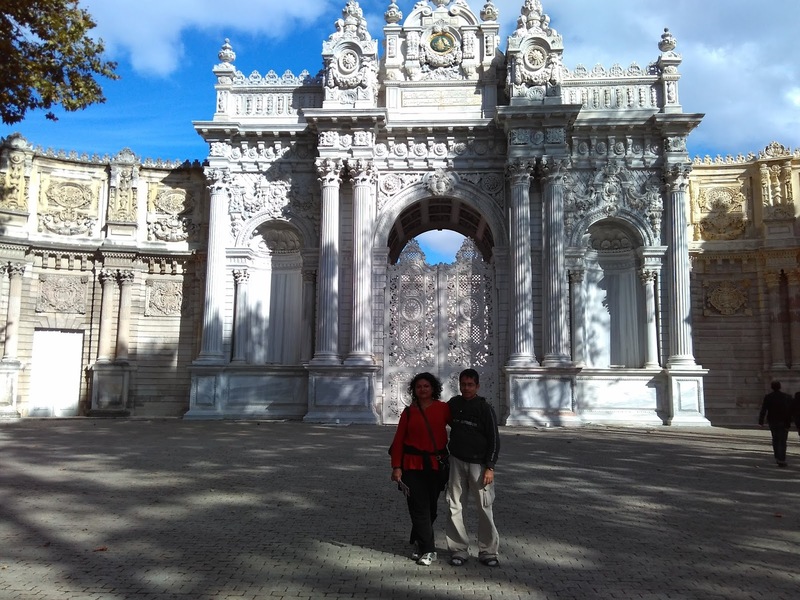 Then we decided to go to Dolmabahce Palace - for that we took another tram - It is very near to Besiktas - we actually went there yesterday. On the way we saw some shops selling "sabun" for Hamam. We did not go to any Hamam ! But today (every Monday) the Palace is closed - so we cannot go inside - but the compound itself is nice and the architecture of the place reminds me of Europe - there is a wonderful cafeteria beside the bosphorus - where tea is available for 2.5 TL - much cheaper than our Cafe coffee day ! We spent some time near the the Bosphorus/ cafeteria - then its time for us to go to the famous Bazaar - Grand Bazaar of Istanbul. Mohua was getting annoyed, since I was taking too much time in that part of the city. So we went to Grand Bazaar by tram it was already late. It is is one of the largest and oldest covered markets in the world, with 61 covered streets and over 3,000 shops which attract between 250,000 and 400,000 visitors daily. In 2014, it was listed No.1 among world's most-visited tourist attractions with 91,250,000 annual visitors. 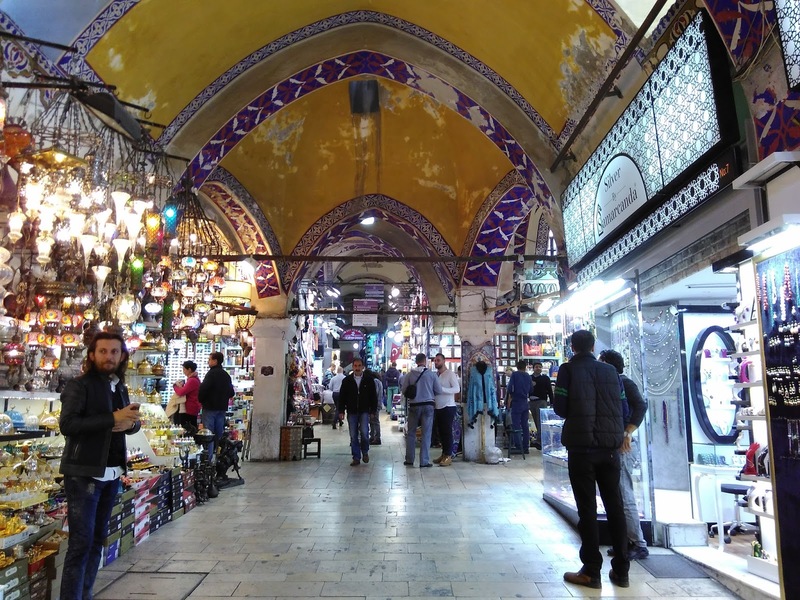 The construction of the Grand Bazaar's started during the winter of 1455, shortly after the Ottoman conquest of Constantinople. We bought so many things that we almost missed our flight. Luckily when we reached the airport, we found that plane is delayed because of change of clock time (probably due to day light savings) . We reached Delhi in time and took the evening Duronto to reach Kolkata on 28.10.15. Tìm hiểu http://mayduavong.me/nen-mua-may-dua-vong-tu-dong-loai-nao-tot-nhat-gia-bao-nhieu/ và địa chỉ uy tín tại Hà Nội và TP.HCM bán http://anthaison.vn/sp/may-dua-vong-tu-dong-ts/ máy đưa võng chất lượng nhất, pediakid d3 có tốt không nên dùng cho trẻ mấy tháng tuổi, siro hỗ trợ tiêu hóa Pediakid Transit Doux cho trẻ có tốt không, siro tăng cường trí não cho trẻ pediakid omega 3 có tốt không có tốt không, bột uống pediakid tăng chiều cao có tốt không, hay siro nào tốt cho trẻ biếng ăn kích thích trẻ ăn ngon.